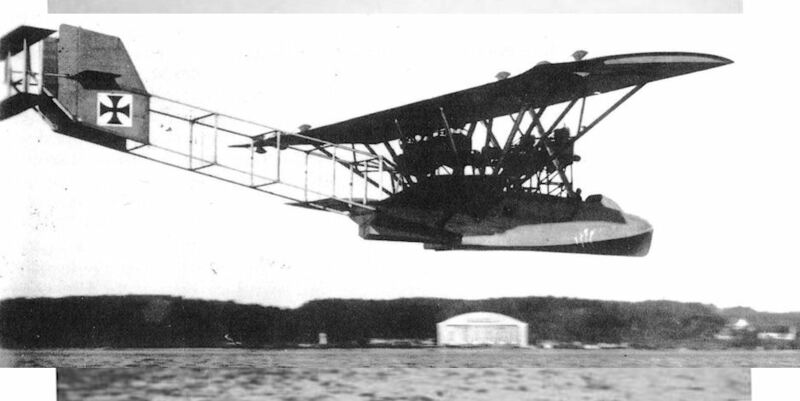 Sikorsky's first "Ilia Mourometz" on a test flight during February 1914. SSW R.I 1/15 at Neumunster, May 1915. From the left - Karl Friedrich von Siemens, Franz Steffen and wife, Dr. Walter Reichel, Bruno Steffen and Dipl.Ing. Dinslage. The SSW R.I modified by having windows fitted around the control position. 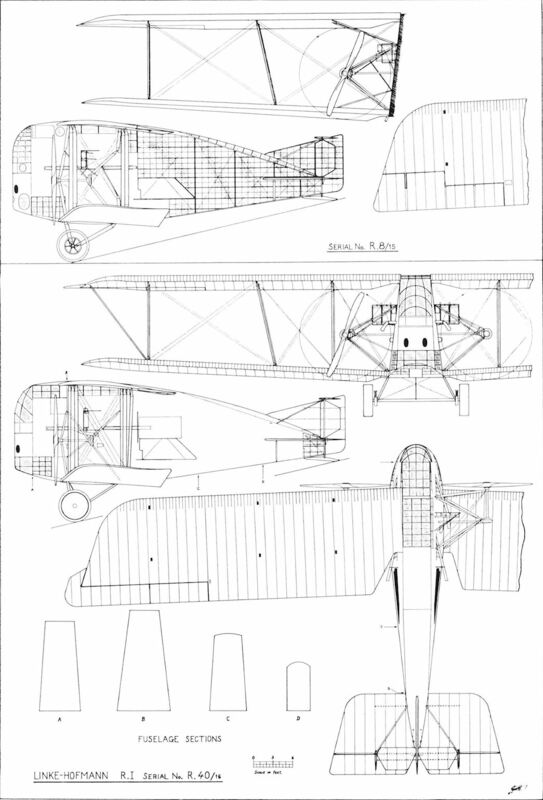 SWW R.I 1/15 at Bialystok aerodrome (F.Fl. Abt.2) on the Eastern Front 1915. 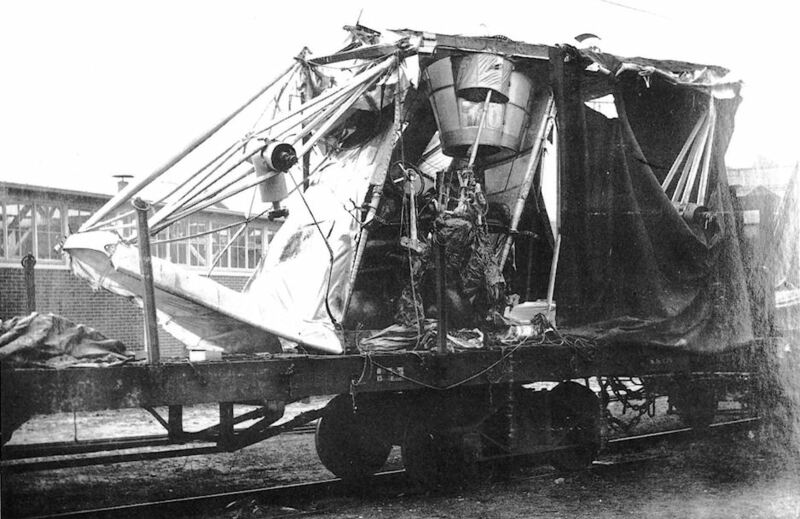 Crash of the SSW R.I 1/15 after engine failure at a height of 8 metres in August 1915. 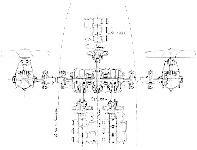 The SSW R.I with strengthened transmission system. This took the form of additional tube on either side of the driving shaft. The SSW R.I shown wrecked while on a railway wagon owing to lack of clearance. 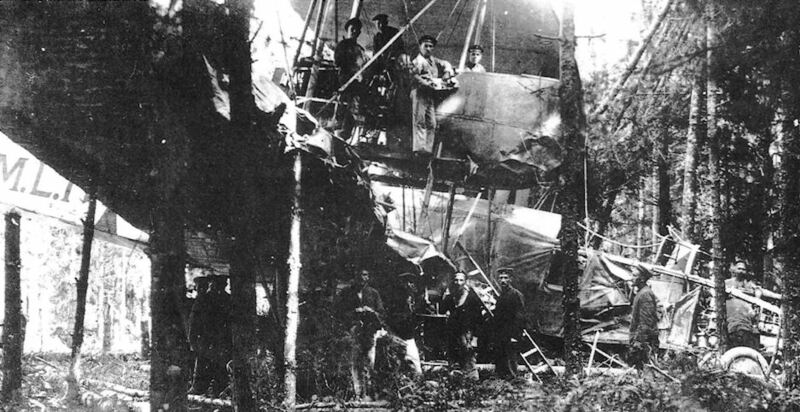 The upper gun turret can be seen in the wreckage. 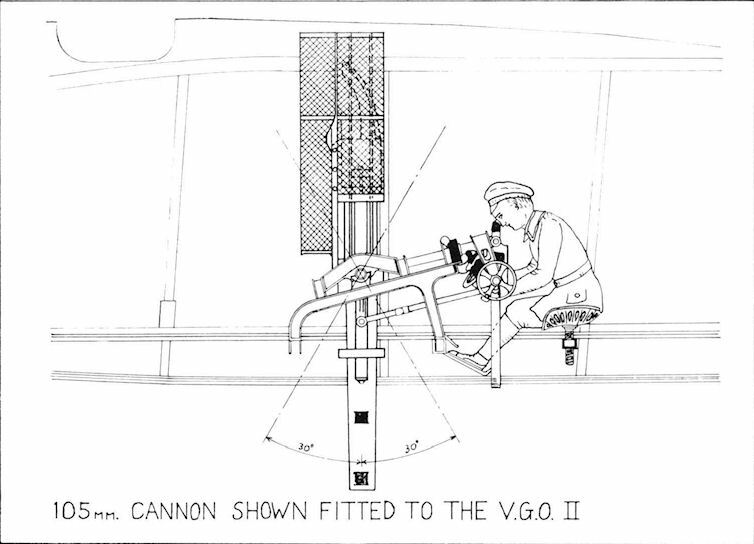 The VGO.I shown in its original form during the spring of 1915. 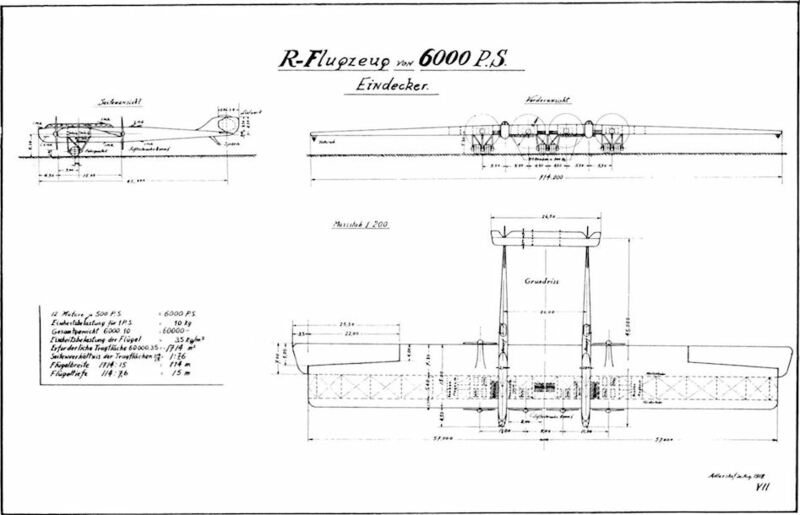 This machine was the ancestor of the Staaken line of R-planes. VGO.I. The double interplane cables are here shown faired without first being drawn together as they were on all later types. Standing in front of the aircraft are (from L. to R.) VGO engineers Hans Baumeister, Philipp Simon and Foreman Hungs. 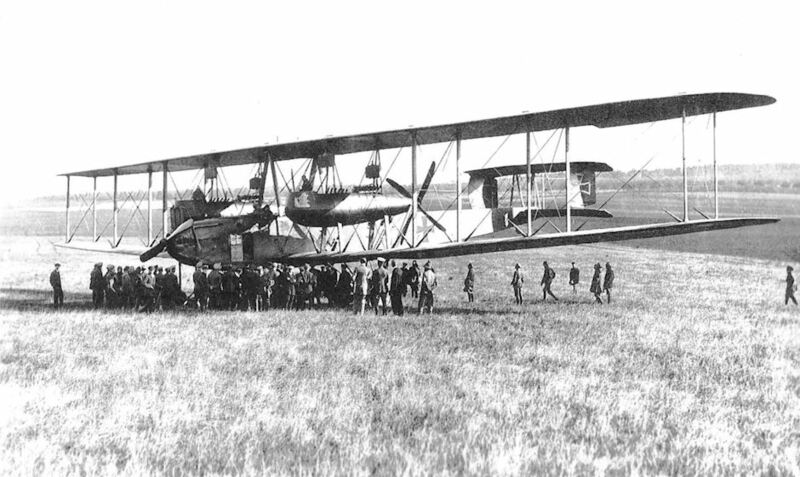 The VGO.I on its maiden flight at Gotha, 11 April 1915. 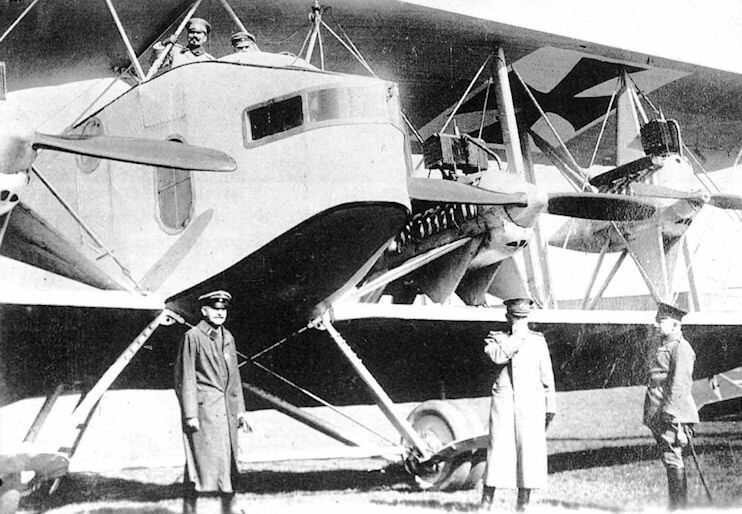 Appearance or the VGO.I in the autumn of 1915, with modified nacelles and new tail unit. Hellmuth Hirth's crash with the VGO.I in the Thuringen Forest. 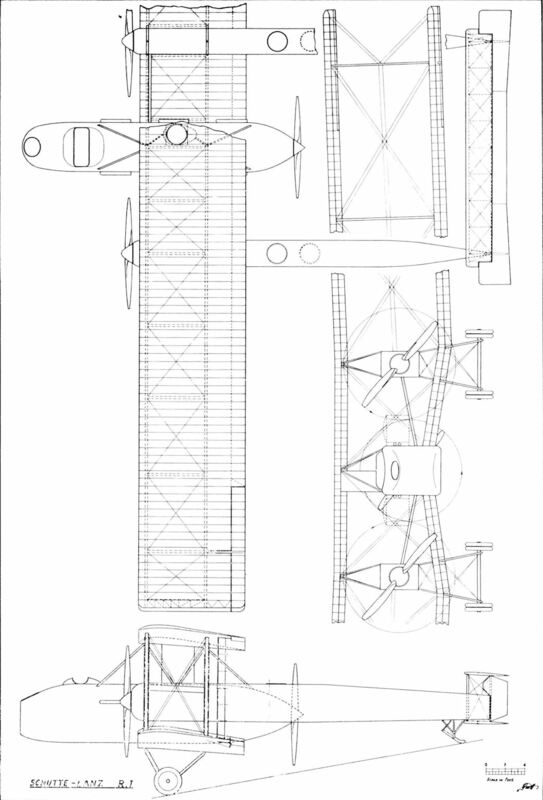 15 December 1915. A further mishap to the RML.I en route to the Front. 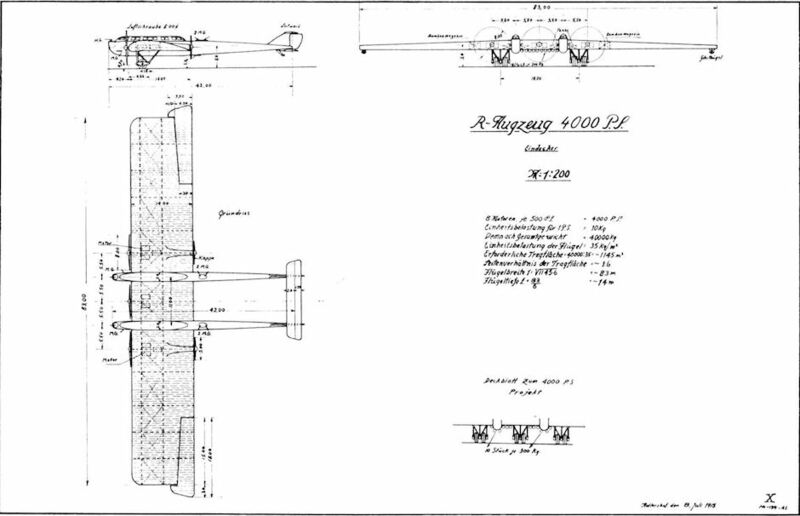 Undercarriage failure on the airfield at Konigsberg. Temporary shelter erected over the RML.I while under repair at Konigsberg. 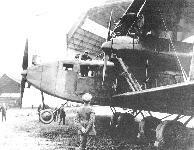 The RML.l as used on operations over the Eastern Front. The RML.I and the VGO.II on the airfield at Alt-Auz. The last landing of the RML.I on the Eastern Front. Crash of the RML.I in the forest near Alt-Auz on 28 August 1916. 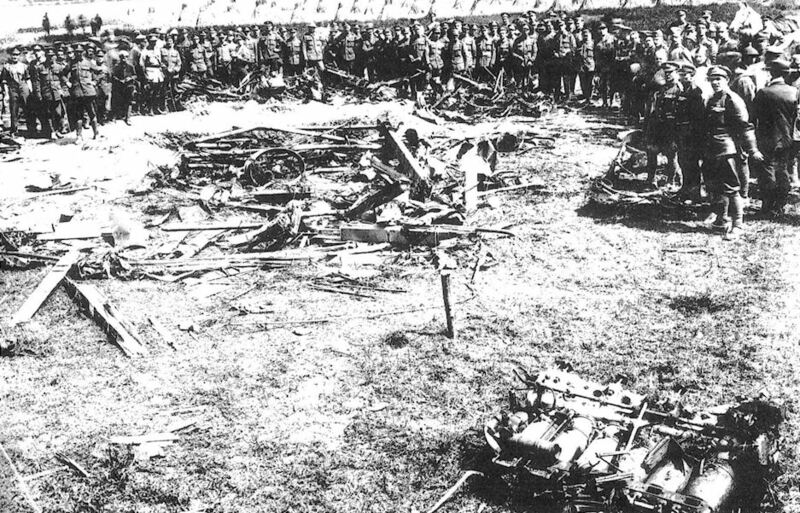 Wreckage of the final version of the VGO.I at Staaken. 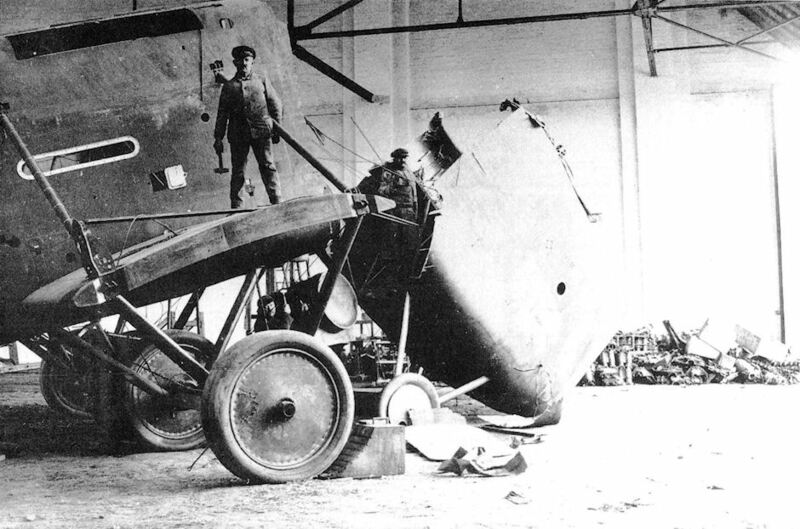 Both Hans Vollmoller and Gustav Klein were killed in this crash on 10 March 1917. VGO.II 9/15. Photo probably taken at Doberitz prior to its service in the East. The VGO.II 9/15. Photo dated 5 November 1915. VGO.II 9/15. Officially credited with being the first R-plane to perform a successful bombing raid. Photo dated 5 November 1915. 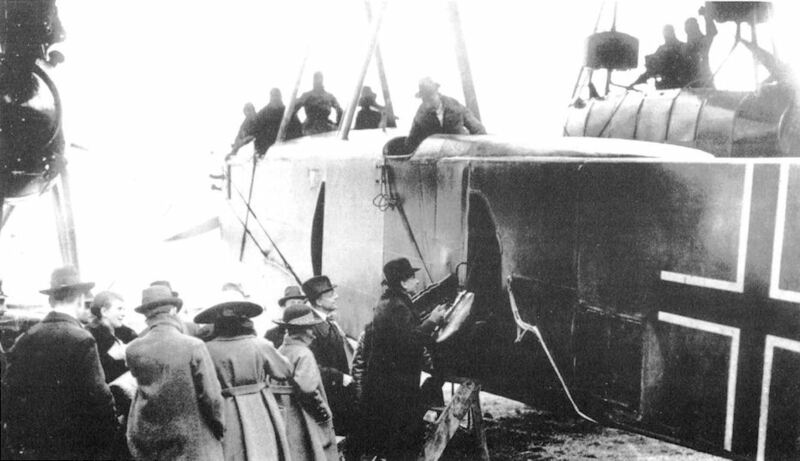 The emergency landing of the R.9 at Paulsgnade near Mitau. A bad landing made by the VGO.II at Paulsgnade. 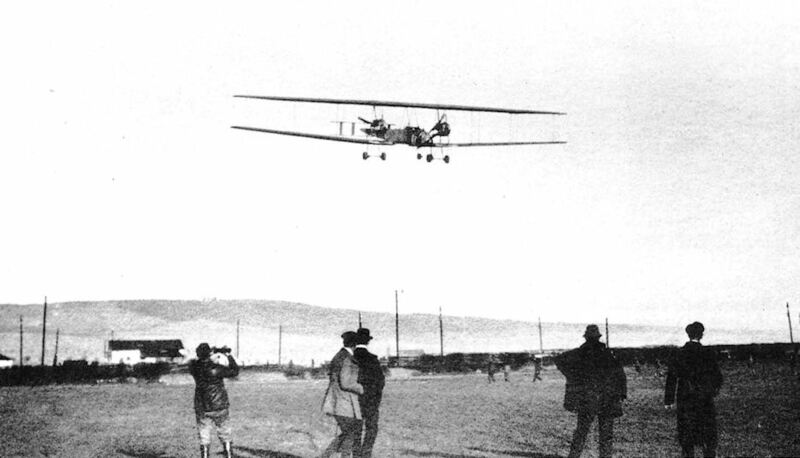 The final landing of the R.9 at Staaken, summer 1917. 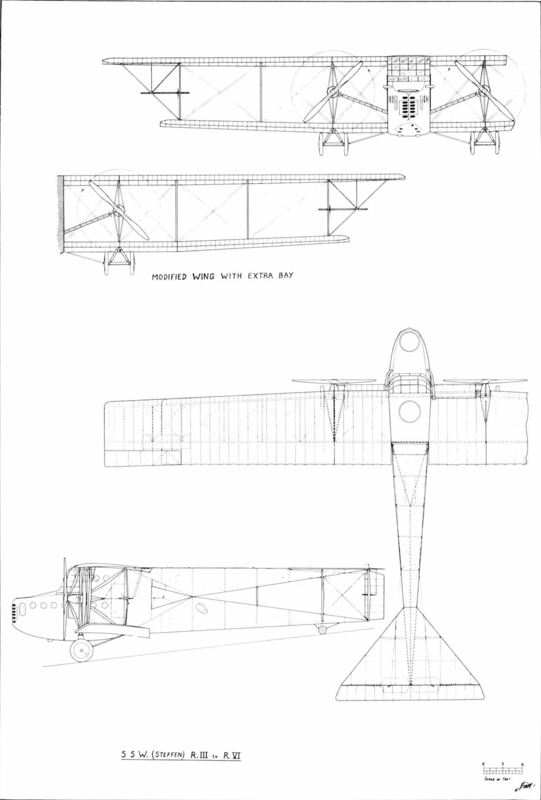 Note the raised tail surfaces. 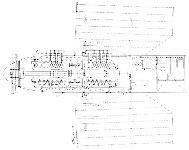 Forward engine arrangement or the VGO.I and VGO.II. 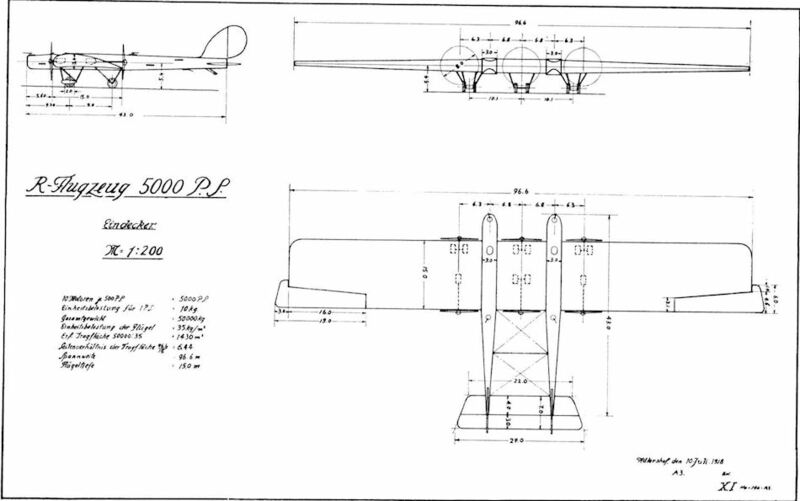 Official drawing shows installation of 105 mm. cannon, the gun actually mounted in the VGO.II was of 130 mm. calibre. 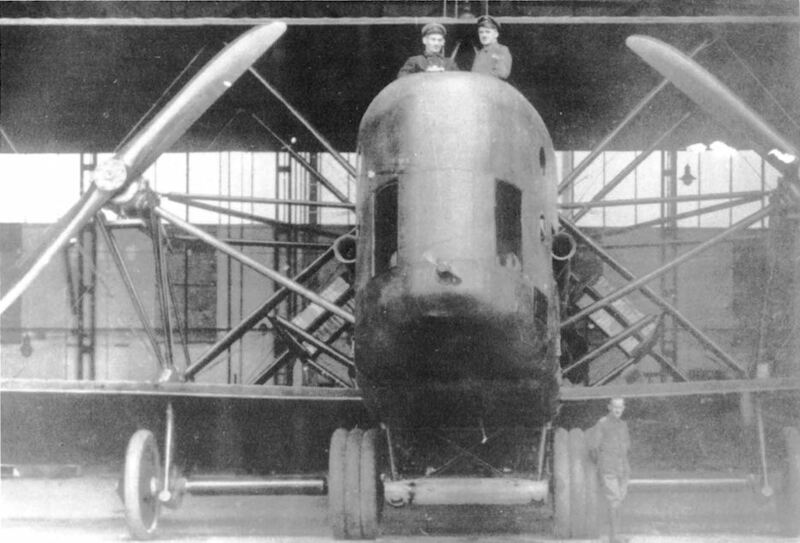 Staaken R.VI 26/16 experimentally fitted with four-bladed propellers. 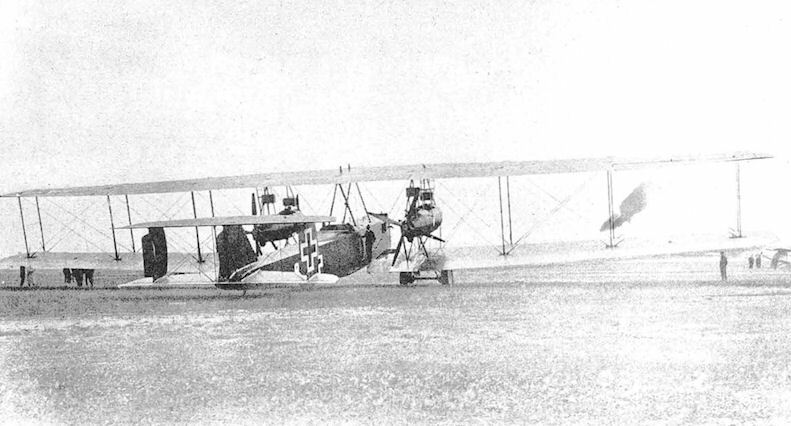 Staaken R.VI (Schul) 27/16 Photo dated 17 October 1917. 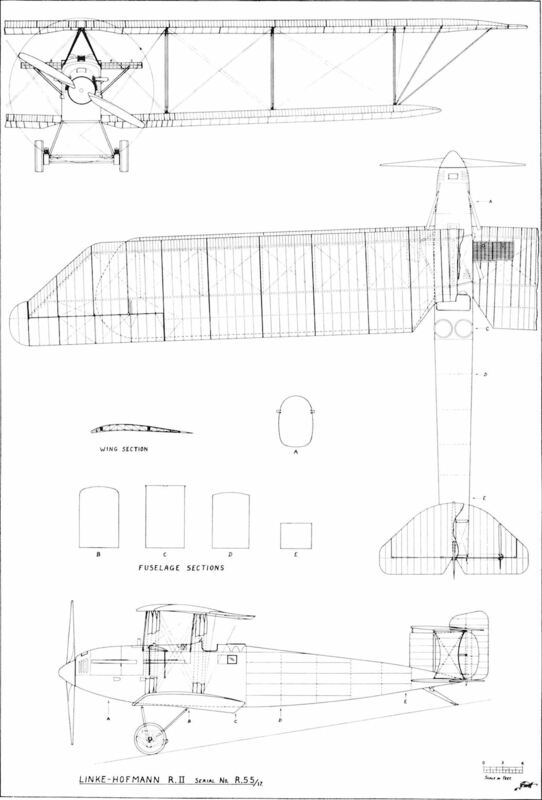 Staaken R.VI(Schul) 28/16. 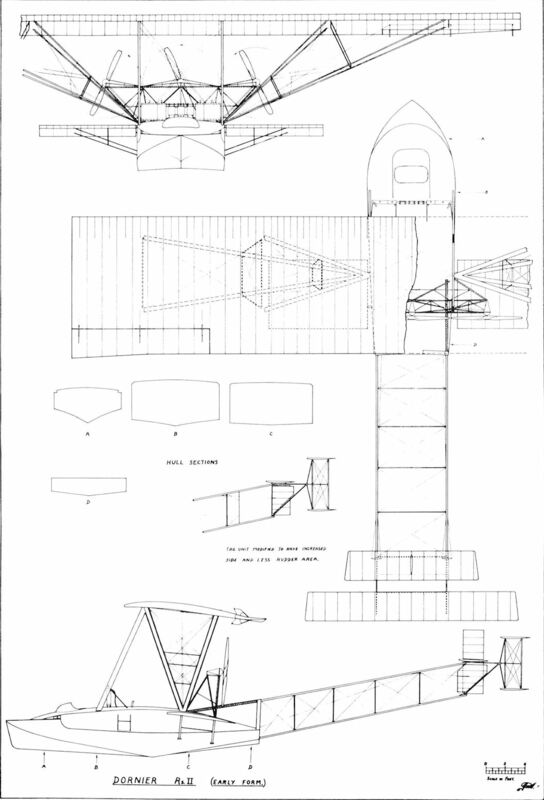 Although eight-wheeled undercarriages were deemed adequate for hard surfaces, operation on sandy airfields required doubling the number of wheels to sixteen. Photo dated 5 February 1918. 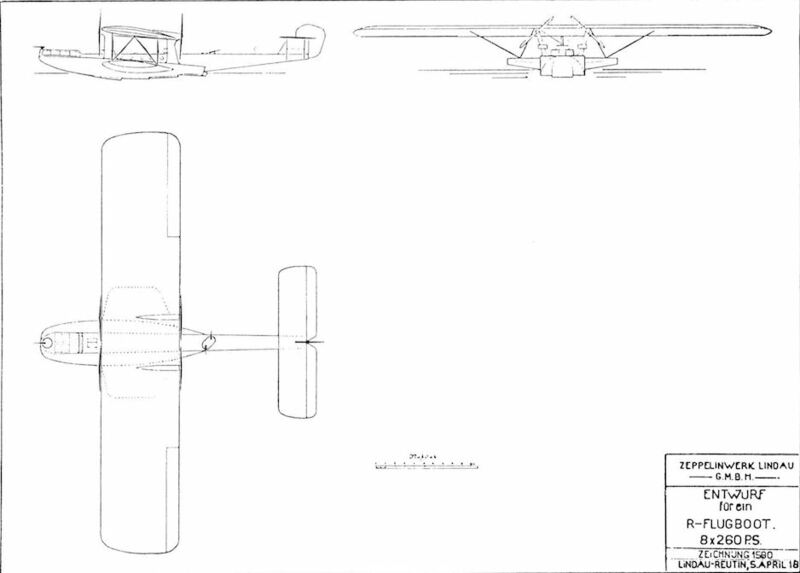 Staaken R.VI (Schul) 28/16. 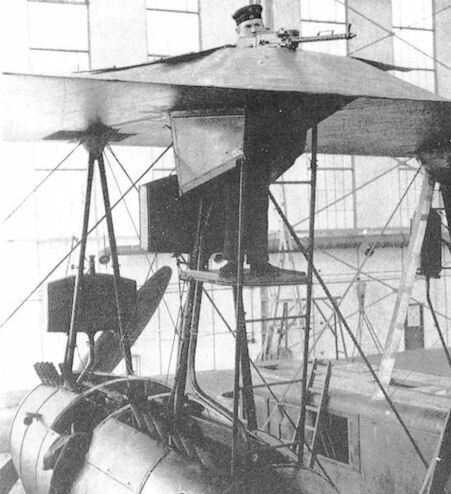 Fitted with upper wing gun position. Photo dated 18 May 1918. 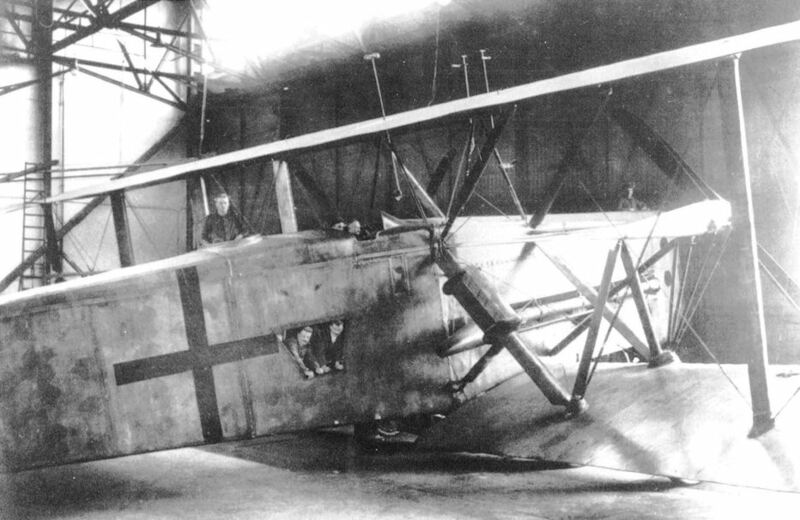 Staaken R.VI 30/16 prepared for flight. Before installation of supercharger. Oberleutnant Meyer is the pilot. 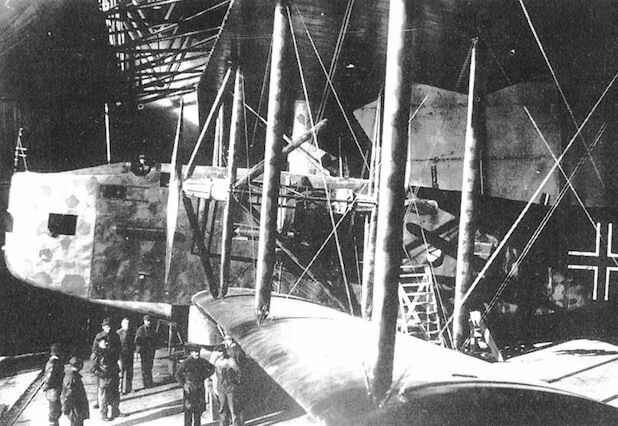 Staaken R.VI 30/16 being fitted with supercharger in the Staaken airship hangar. In the background is the Staaken R.XIV 43/17. Interior view of the R.30, showing the supercharger and its petrol driven engine. 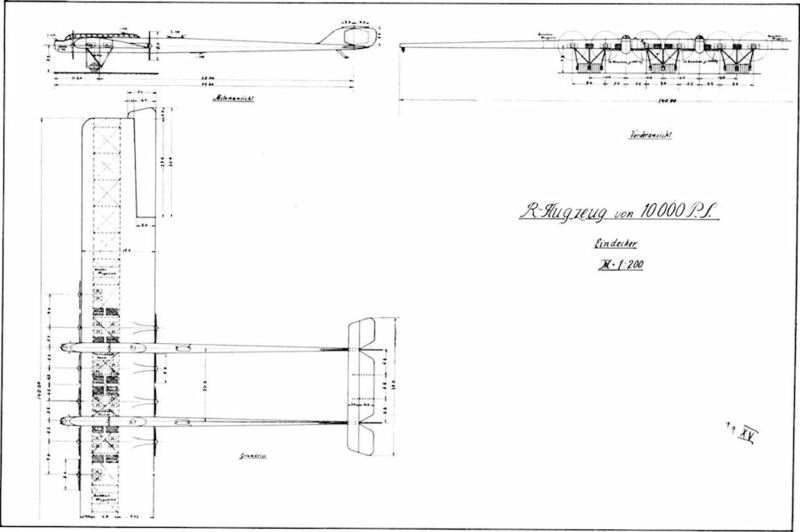 Upper wing gun position on the R.30. 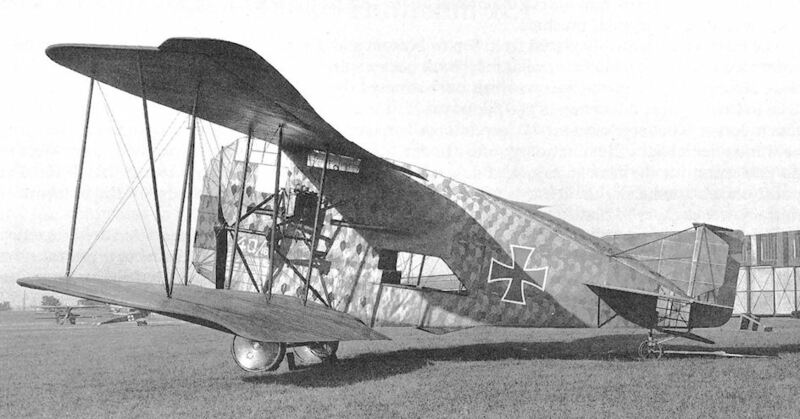 The Staaken R.VI 30/16, in civil guise after the war. The airship overhead is the Bodensee. Staaken R. VI(Av) 33/16 being inspected by an Idflieg acceptance team at Leipzig. Hptm. Schilling with officers of Rfa 500 in front of Staaken R.VI(Av) 33/16. 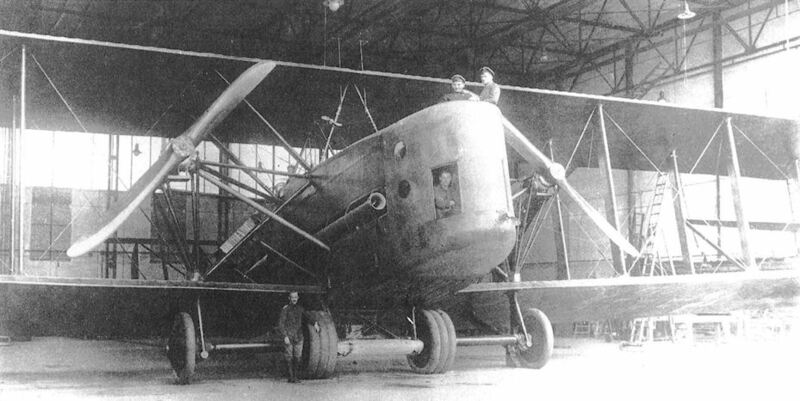 The Staaken R.VI (Av) 33/16 under construction. 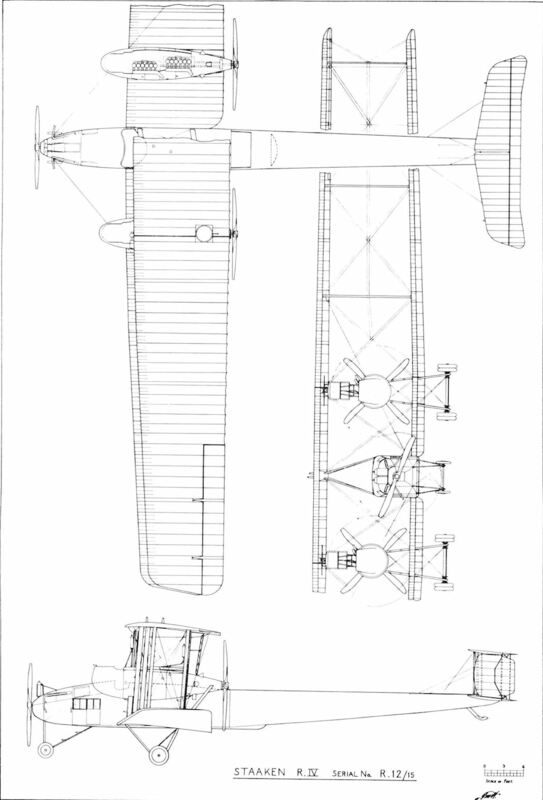 Staaken R.VI(Av) of Rfa 500. 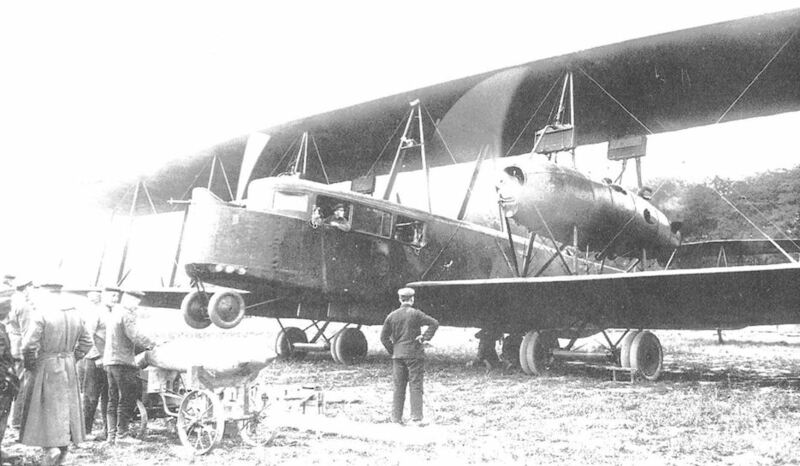 Staaken R.VI(Albs) 36/16, and R. VI(Av) 33/16 of Rfa 500 being prepared for flight. The same two aircraft lined up. 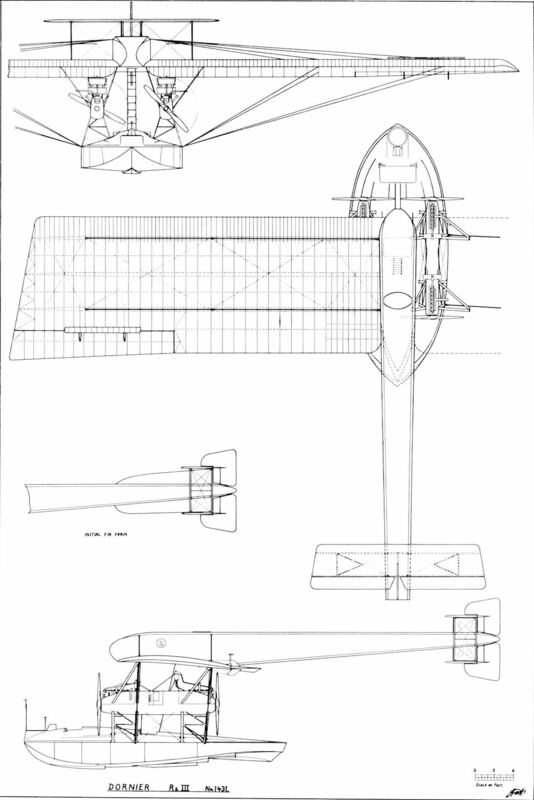 The balanced ailerons and central fin of R.36, the nearest machine shows this to be a later model than its companion. The Staaken R.VI 39/16, taking on bombs prior to a raid. 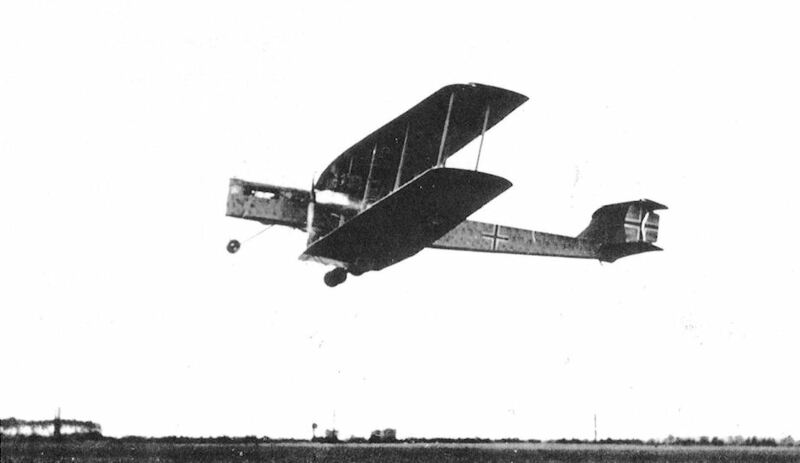 A Staaken R.VI in flight. 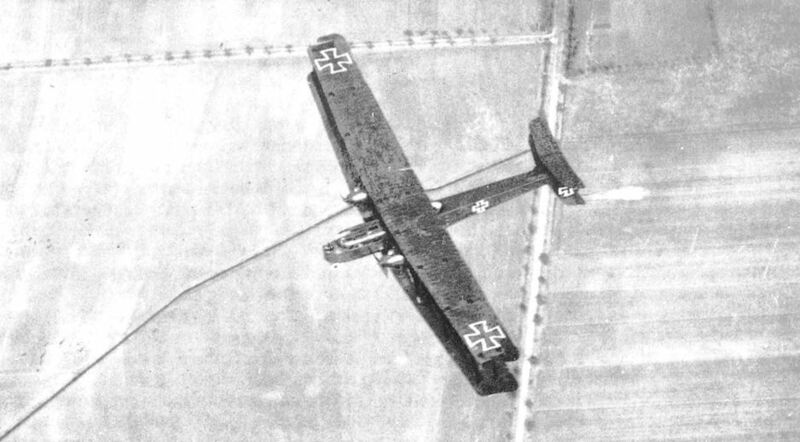 Staaken R.VI(Av) 52/16 during a test flight over Leipzig. 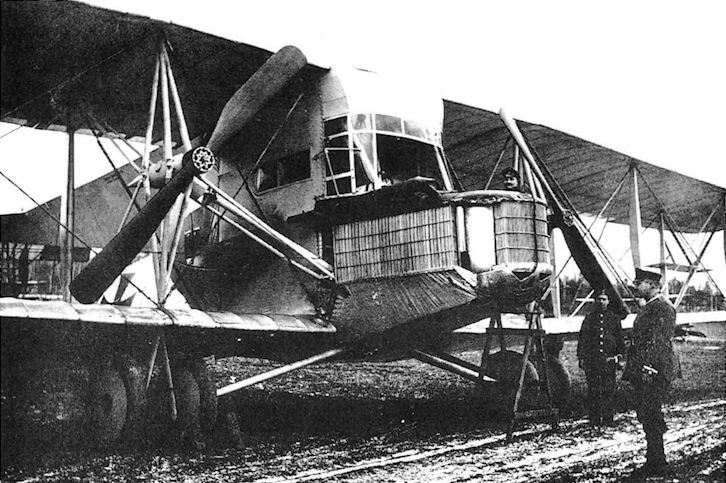 Staaken L fitted with a wheeled undercarriage for delivery from Staaken to the company seaplane facility at Potsdam. 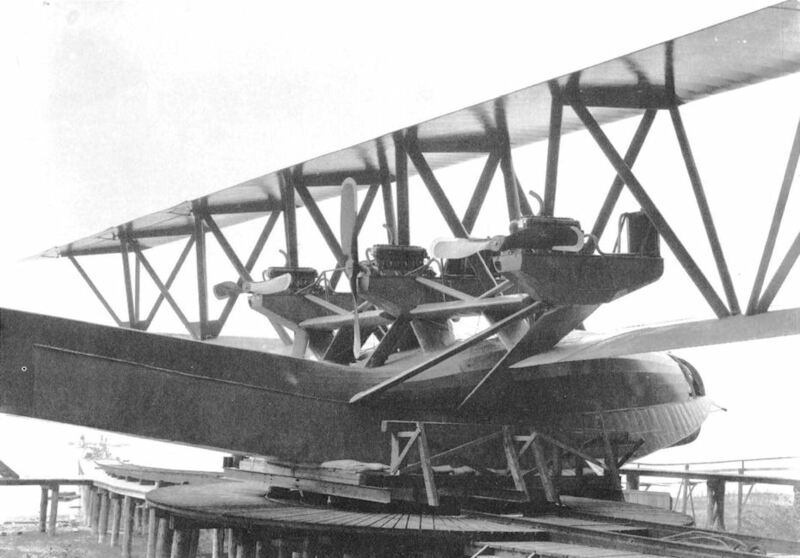 Staaken L on floats and carrying the nickname "Lisbet" in the Staaken hangar at Potsdam. The Staaken L photographed at Warnemunde test centre on 13 February 1918. 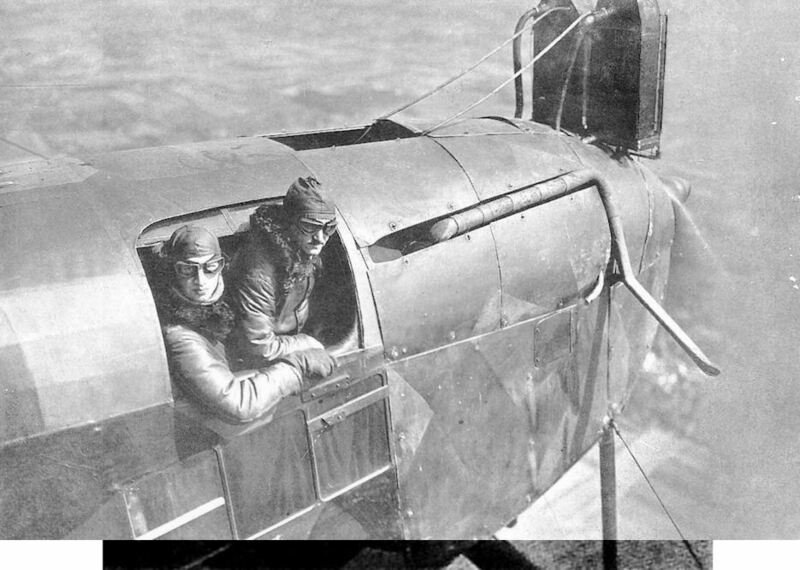 Pilots' cockpit of Staaken R VI 31/16. 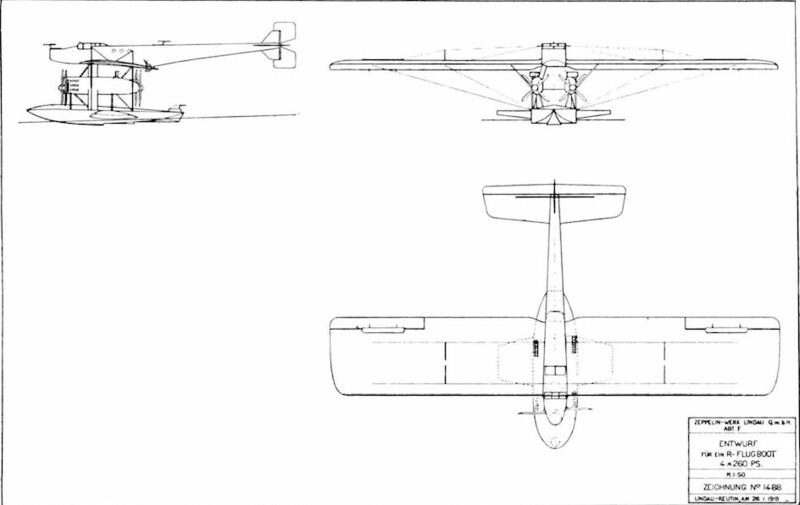 The apparent deficiency in the number of instruments is explained by the fact that engine indicators were situated in the mechanics' cockpits in the engine nacelles, whence they kept the commander informed of the condition of their charges by a signalling system, whose battery of lights and switches can be seen in the roof panel in the upper photo. 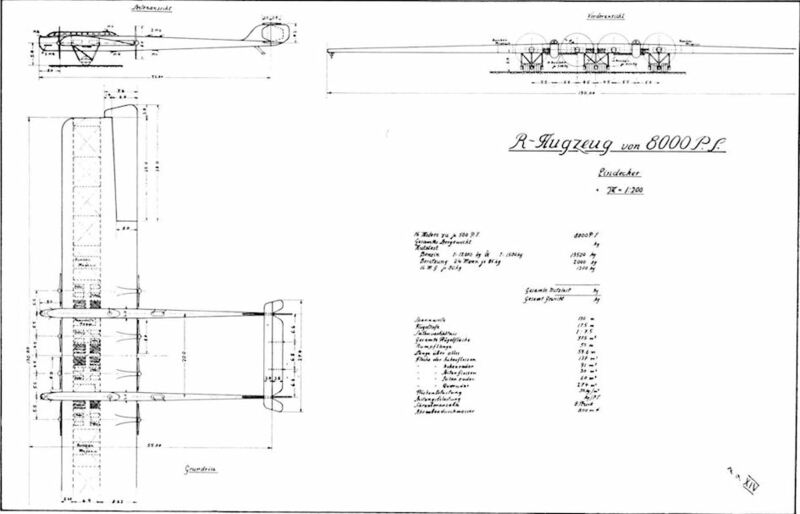 Note the two barographs that recorded height against time on a clockworkdriven paper cylinder, the carriage of these being a normal requirement on all German military aircraft. The dual flying controls with the throttle levers on the pedestal and the tail trim wheel at the rear is a layout that has not changed in principle over 70 years. The hand-operated drum for the trailing wireless aerial can be seen on the left and two mouthpieces and speaking tubes are draped over the navigator's table on the right. 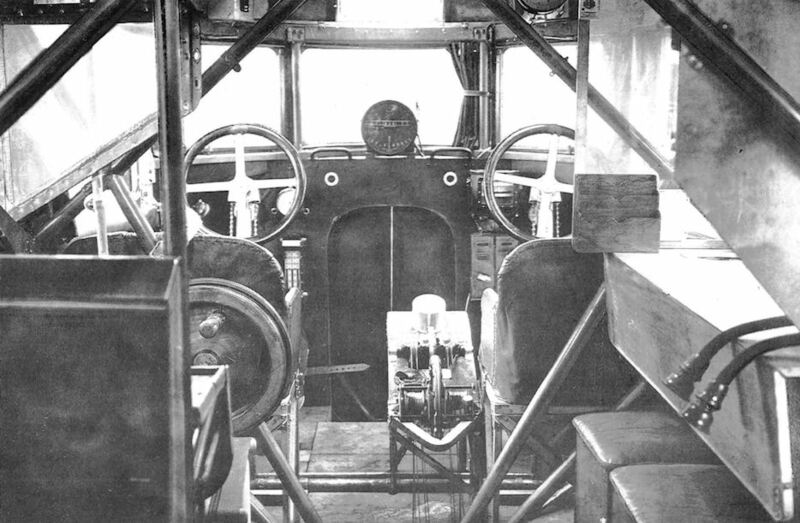 Prominently positioned in the centre of the forward windscreen (note stowed curtain at right vertical member for excluding searchlight glare) is the Drexler bank indicator, which used a front view of the aeroplane on a moving card stabilized by a gyroscope revolving at 20,000rpm powered by three-phase current provided by a windmill generator, thus being independent of the aircraft's electrical system. 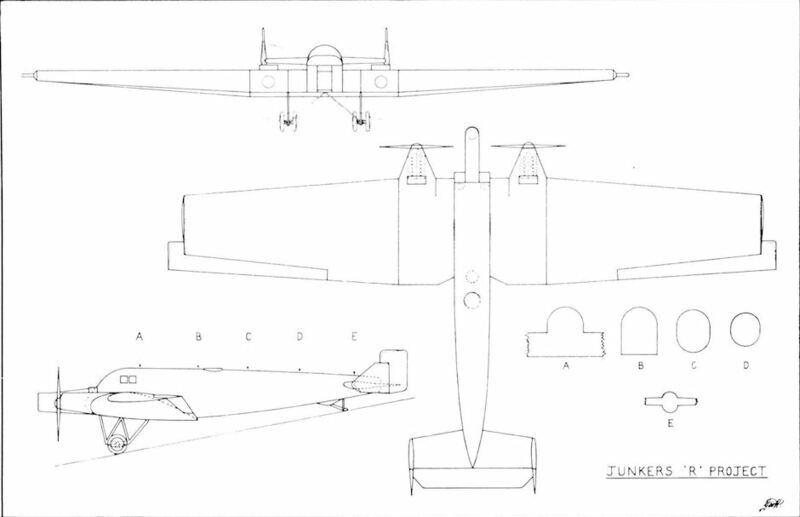 Wooden model of the Junkers R.I used for wind-tunnel tests. 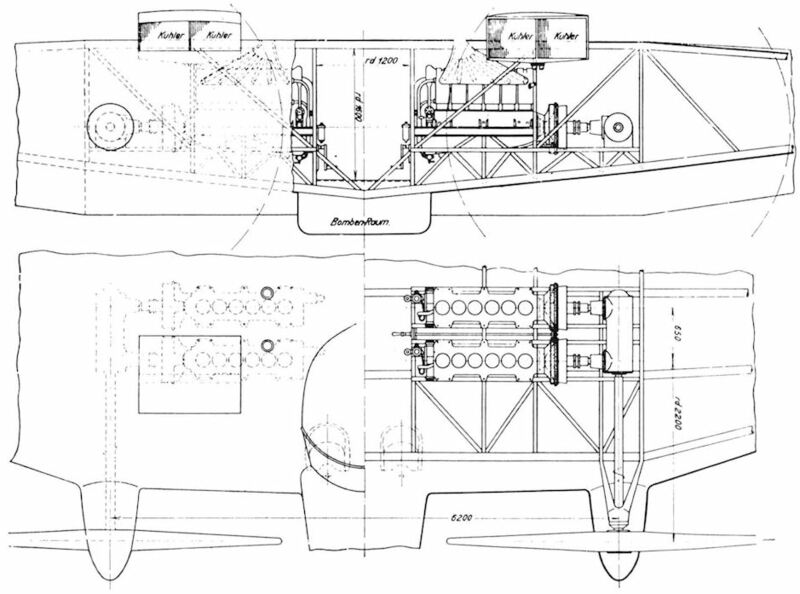 Junkers R.I. Engine and power transmission arrangement. Linke-Hofmann R.I 8/15 during assembly, showing the Cellon skin covering. Linke-Hofmann R.I 40/16 fitted with faired interplane struts. The end of the Linke-Hofmann R.I 40/16. 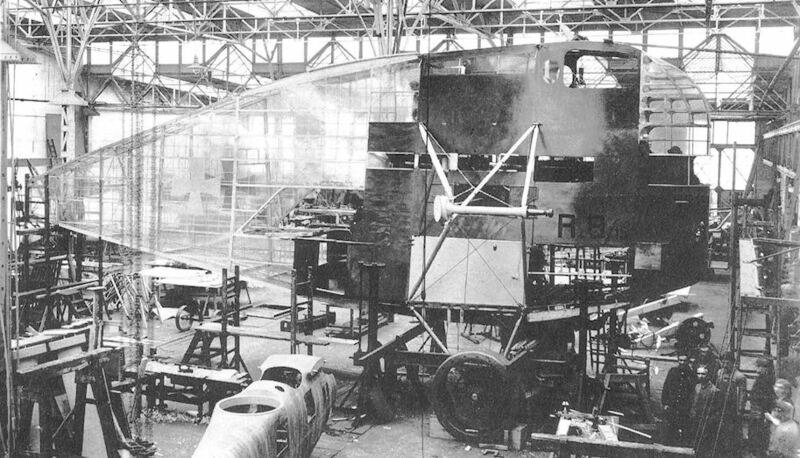 Mock-up of the R.VIII filled with an experimental enclosed revolving turret can be seen behind the SSW E.I in the foreground. Photo dated April 1917. 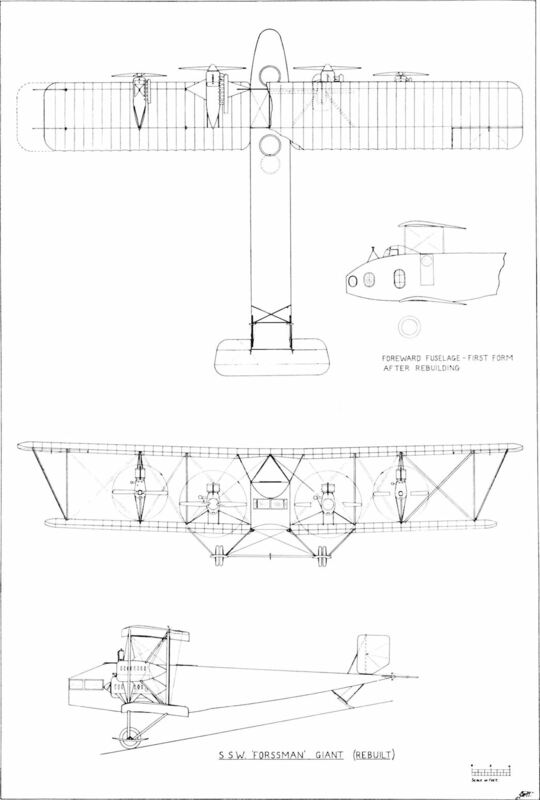 The SSW Forssman '"R" in its original form before leaving the workshop. The SSW Forssman "R". 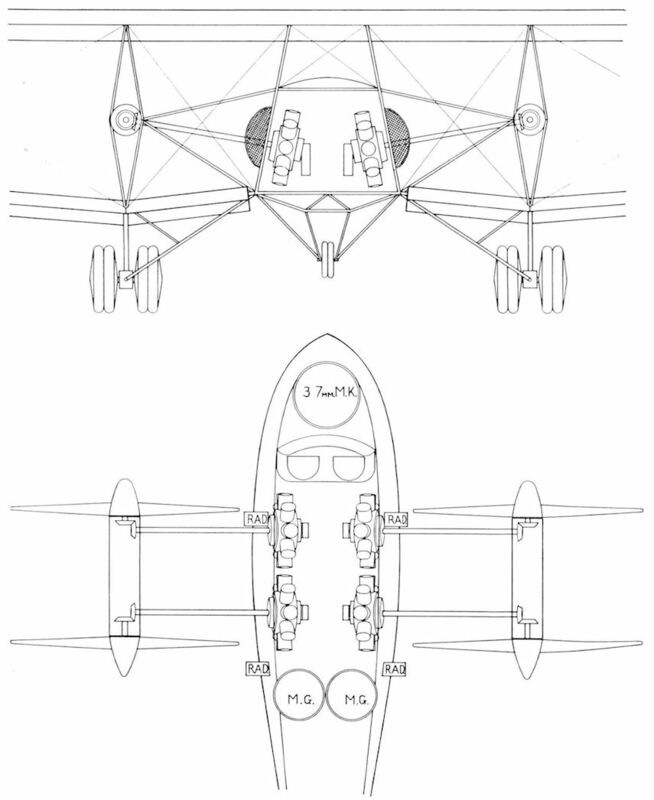 The absence of any centre-rear interplane struts is noticeable in this view. SSW Forssman 'R' fitted with nose pulpit position and showing method of entry into the machine. 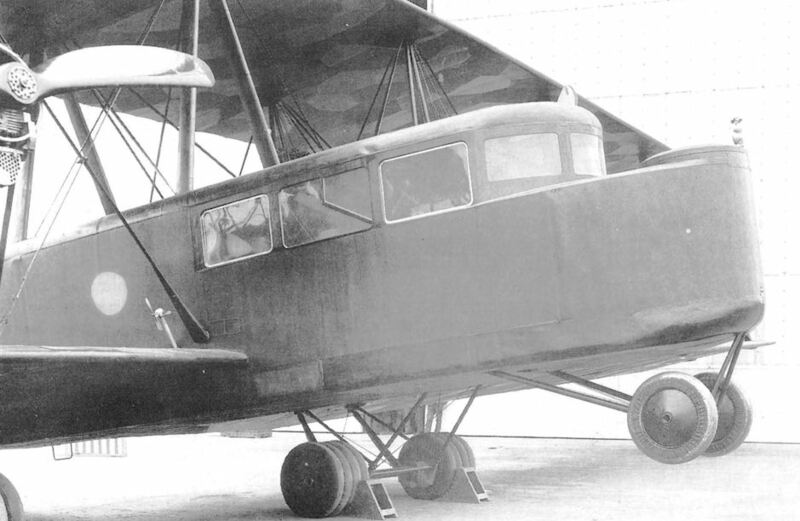 The SSW Forssman "R" fitted with twin rudders. 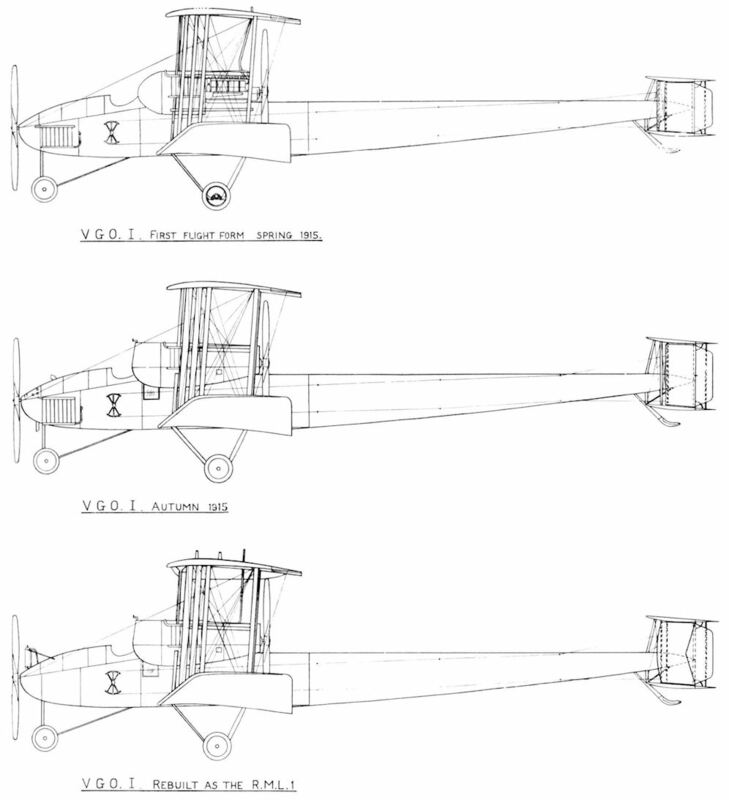 The SSW Forssman "R" in its re-designed form, 29 October 1915. Engine nacelles and nose of the re-designed Forssman "R". SSW Forssman "R" crashed after a test flight by Lt. Hohndorf. The SSW Forssman "R" in its final form taking-off at Johannisthal. 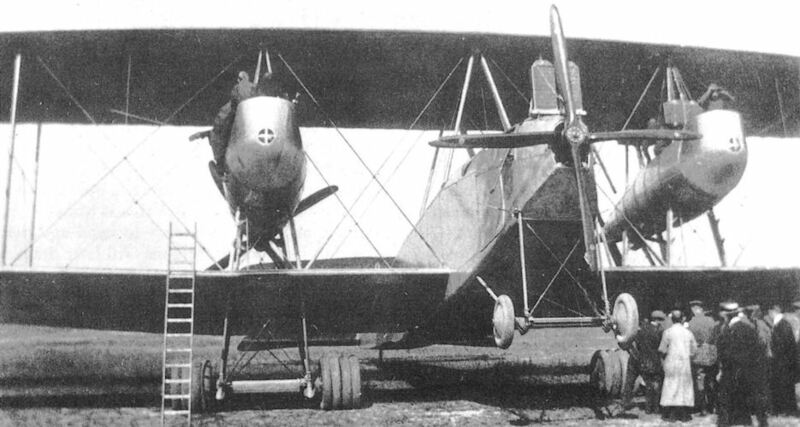 The SSW Forssman "R" with rebuilt nose section at Johannisthal airfield. The SSW Forssman "R" after breaking its back. 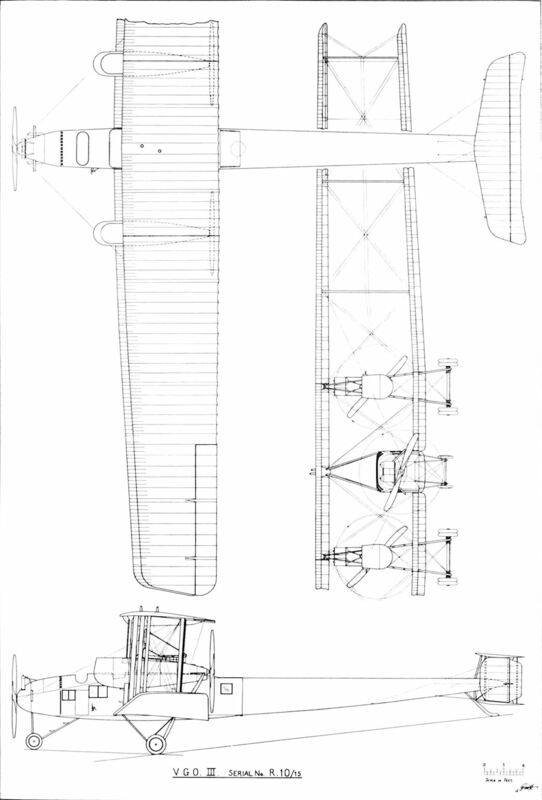 The original form of the Dornier Rs.I with two buried engines. The damage done to the upper wing trailing edge by the shattering of the port propeller can be seen. Photo taken 23 October 1915. 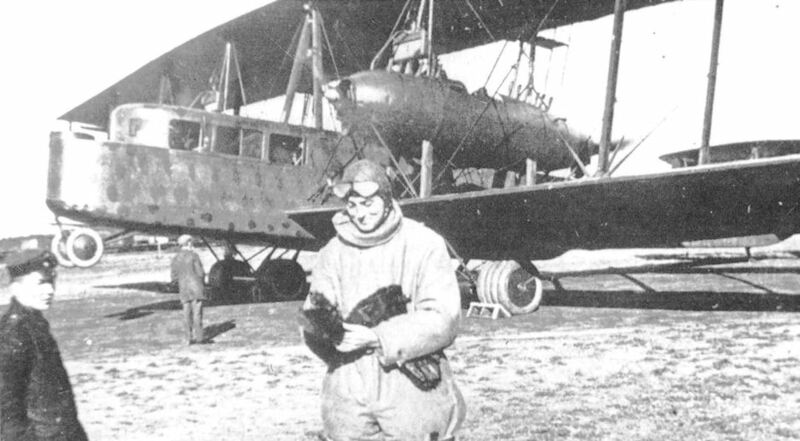 The modified Dornier Rs.I outside the hangar at Seemoos in December 1915. 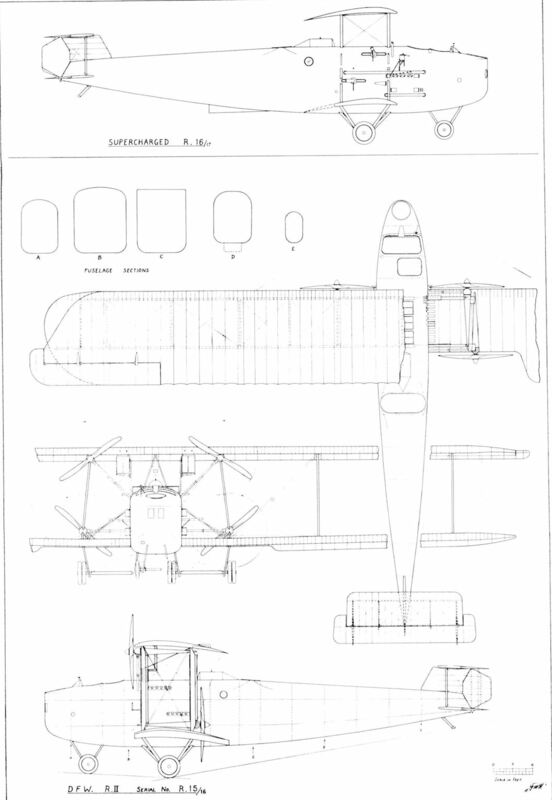 Close-up of the modified engine layout of the Dornier Rs.I. 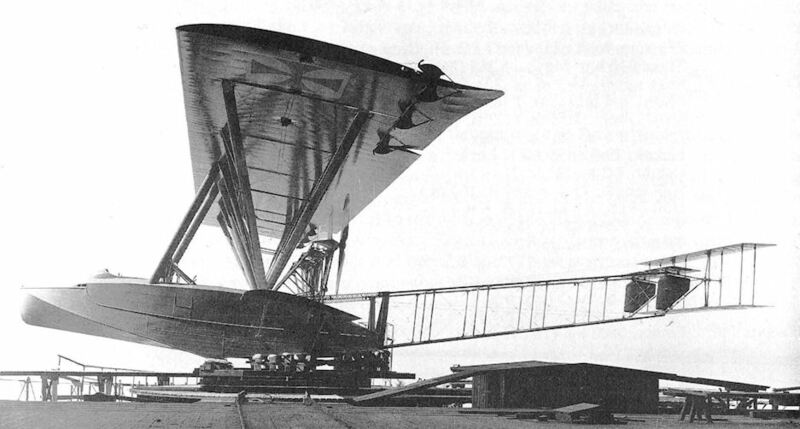 The sole, experimental long range Zeppelin-Lindau Rs I flying boat was wrecked in a storm on 21 December 1915 before it could be flight tested. 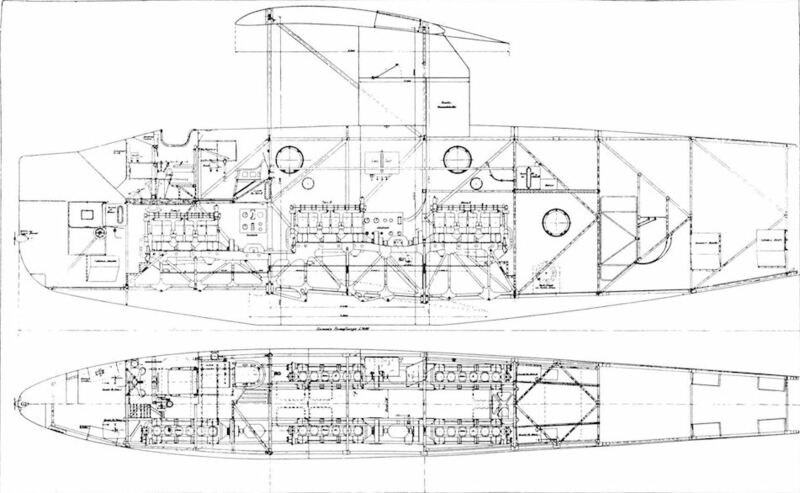 This three 240hp Maybach Mb IV-engined craft was the first of a series of one-off giant flying boats made feasible through the extensive use of light alloys, a field in which their creator, Prof Dr Claudius Dornier, one of Count Zeppelin's brighter proteges, had specialised. 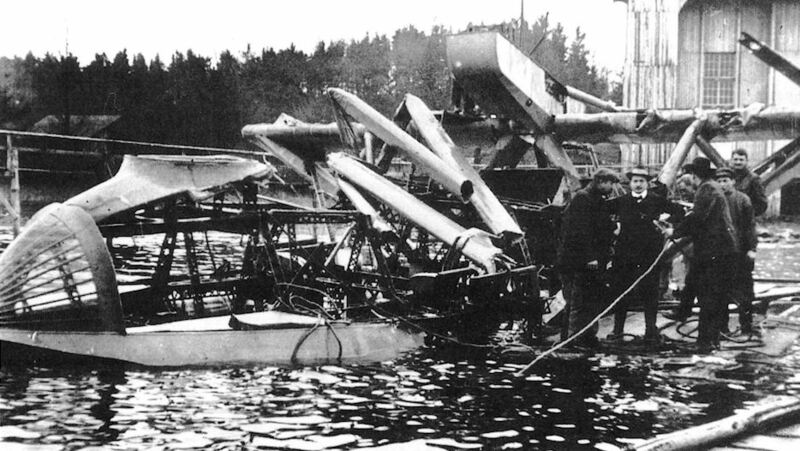 Wreckage of the Dornier Rs.I after it destruction in a storm. 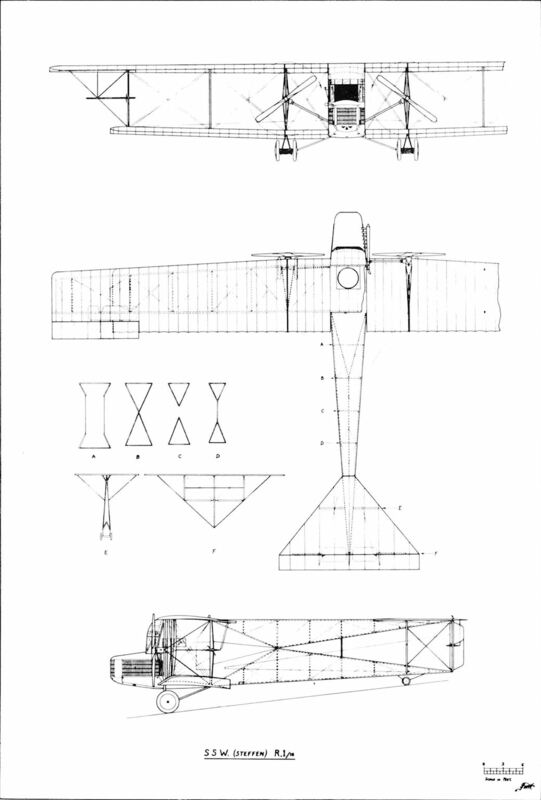 Sikorsky I.M.B (E.V.K. 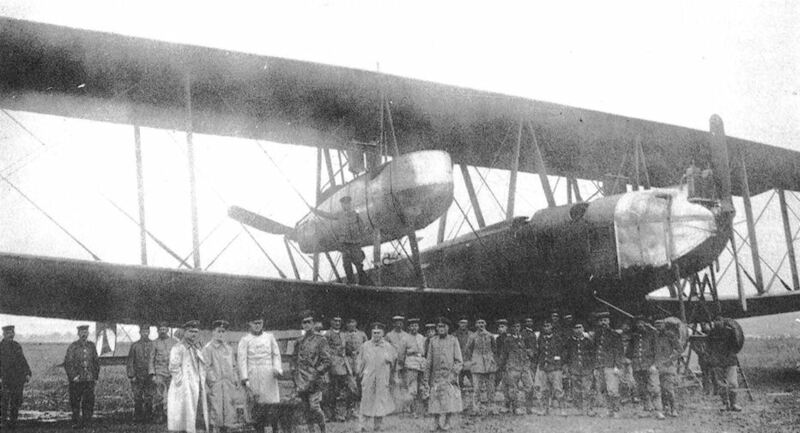 aircraft number VI), at Yablonna in December 1914. 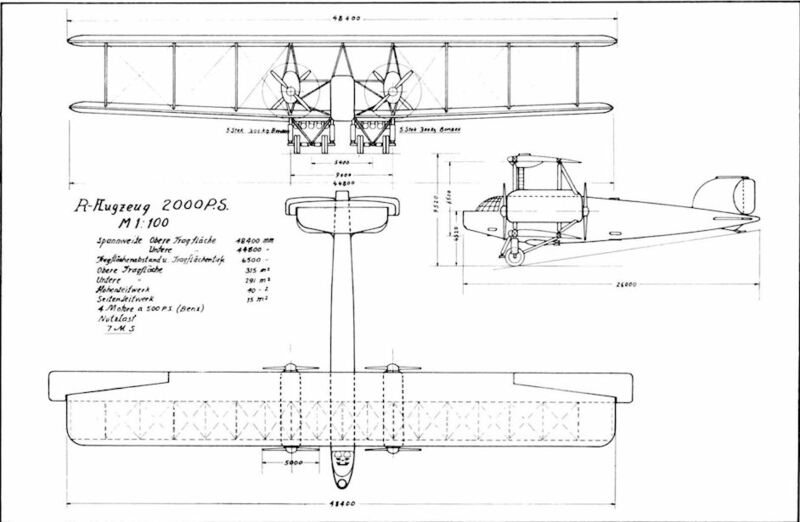 Sikorsky I.M. 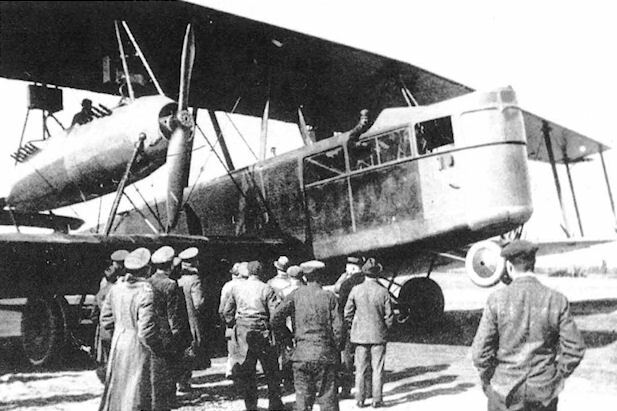 V, one of several aircraft that bore the name "Kievsky". Igor Sikorsky is seen second from the right. 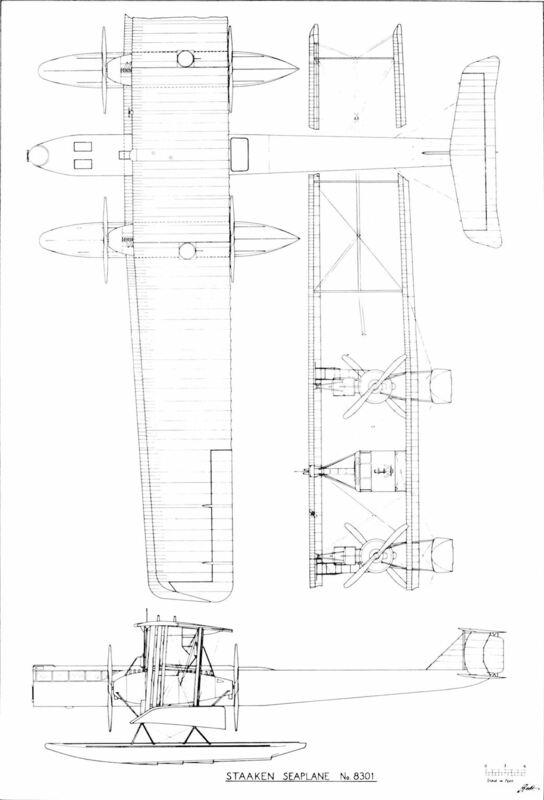 The Union G.I experimental bomber. 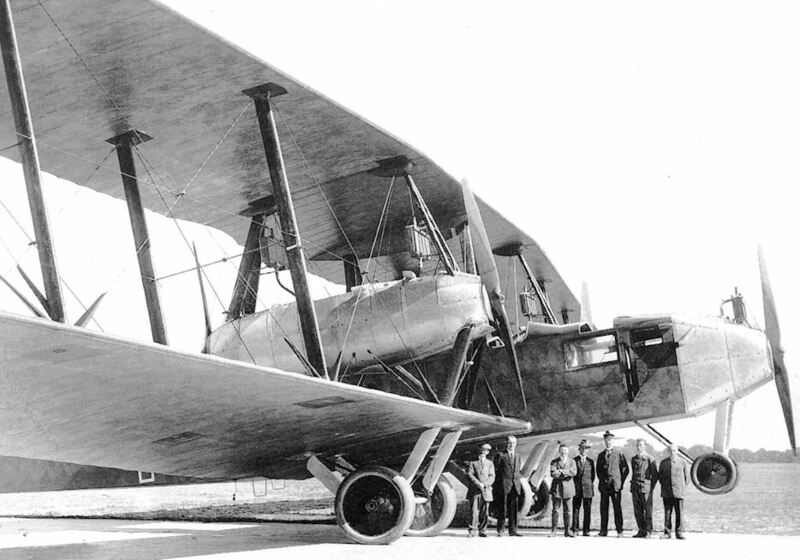 The Four-engined, Single Airscrew Linke-Hoffman R.II 55/17 prototype bomber of 1918. 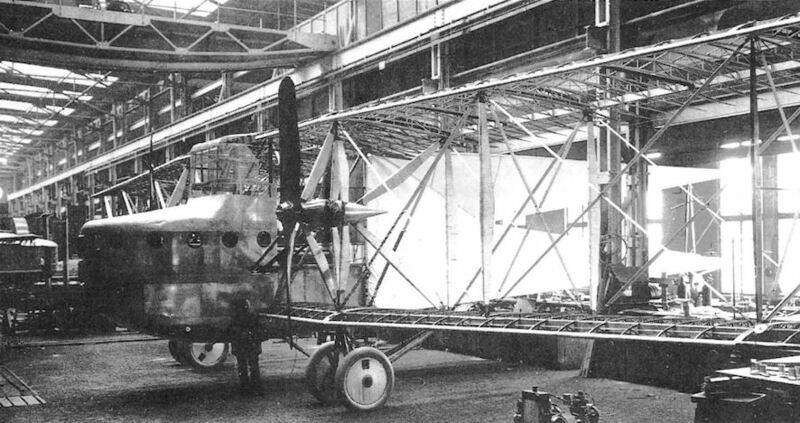 The camouflage pattern and taped stringers are clearly seen in this view of the dismantled Linke-Hofmann R.II. 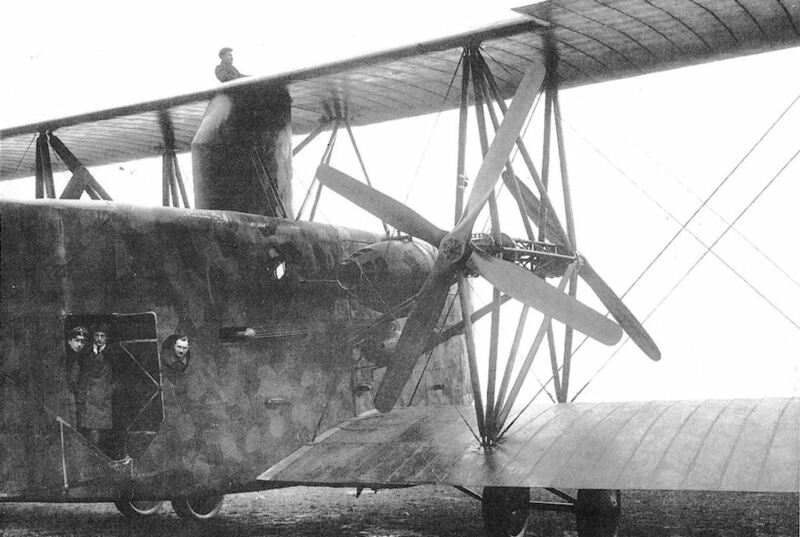 Note the propeller broken during ground tests. 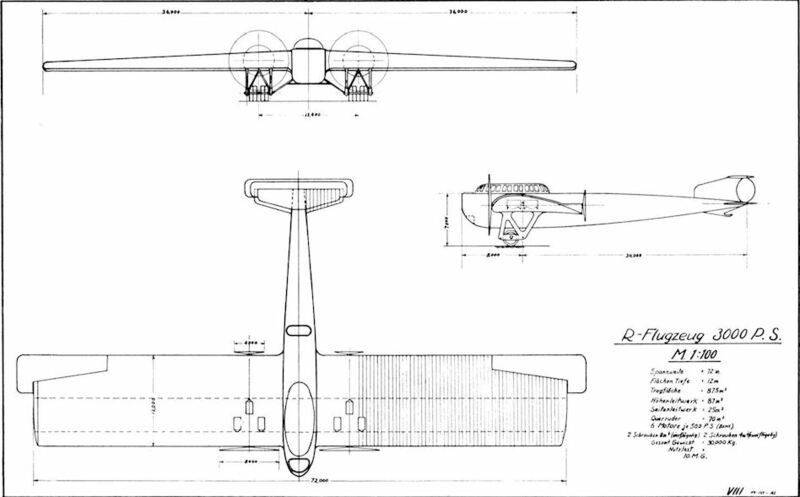 Linke-Hofmann R.II. 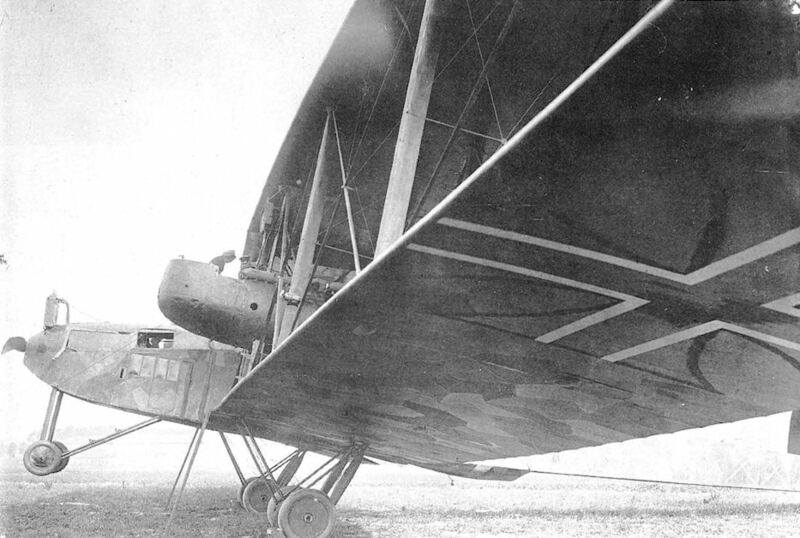 Note semi-retractable turret shown in broken line under the fuselage. 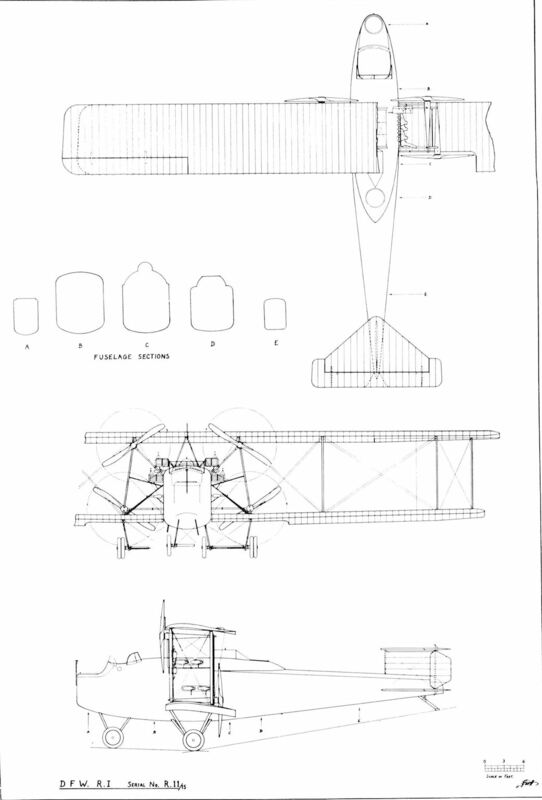 Linke-Hofmann R.II Engine and power transmission arrangement. 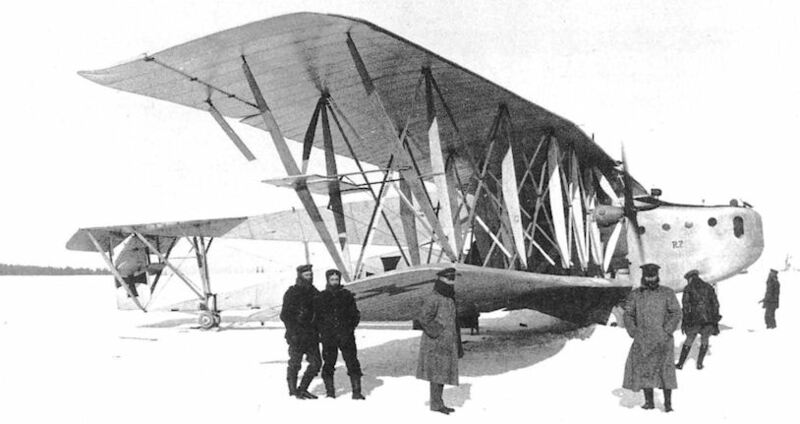 The AEG R.I 21/16 in its original form. 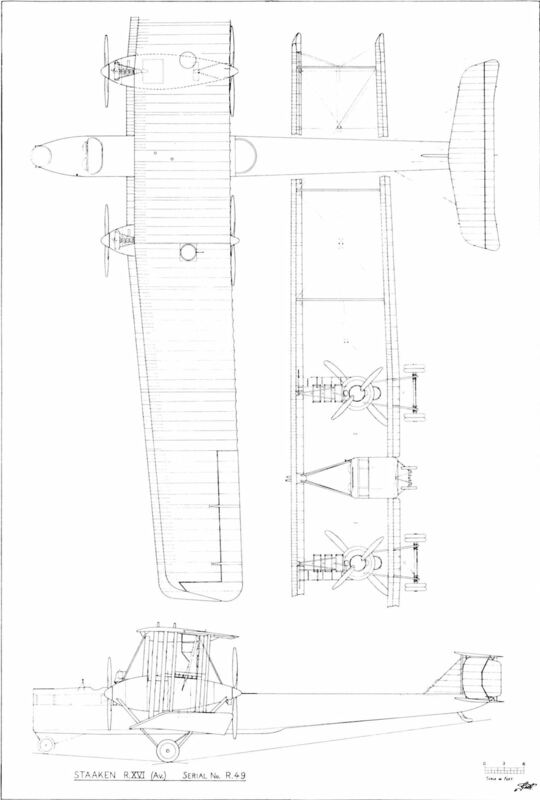 AEG R.I 21/16. 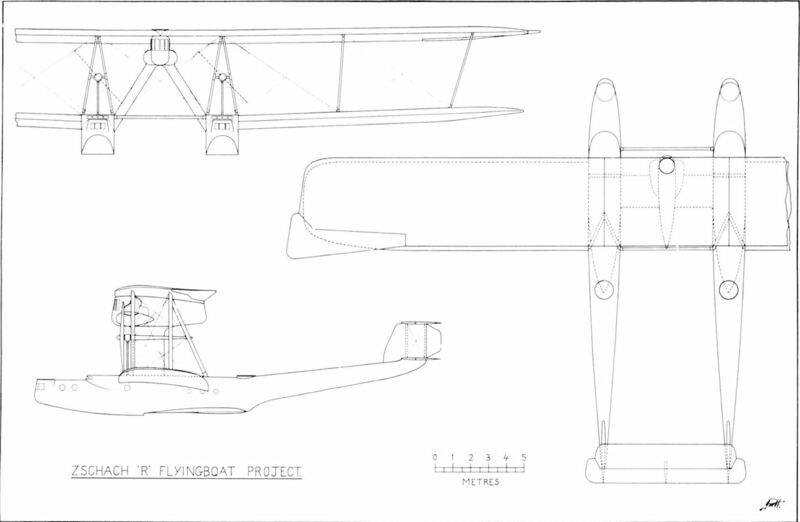 Original form fitted with four-bladed propellers. 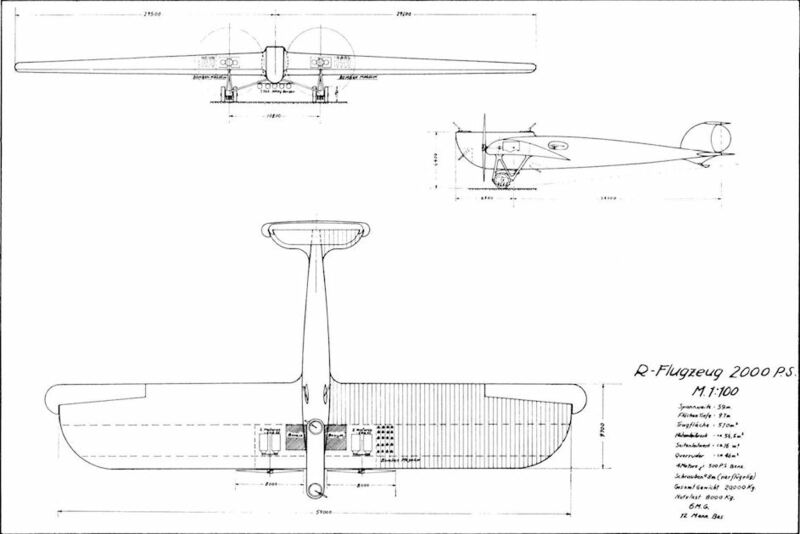 AEG R.I. 21/16 modified to have two-bladed propeller. Obltn. 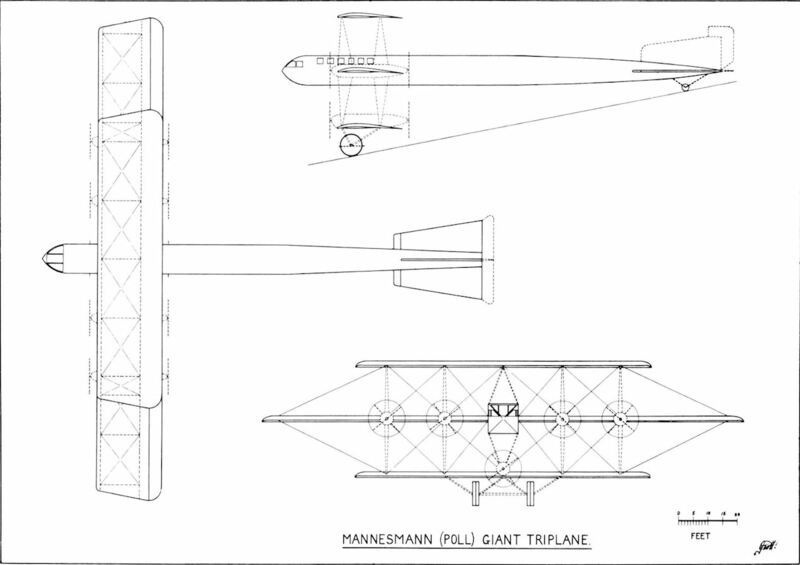 Bruckmann is the tallest man in pilot's uniform beneath the left hand propeller. The final form of the AEG R.I with new type radiators mounted on the lower centre-section struts. 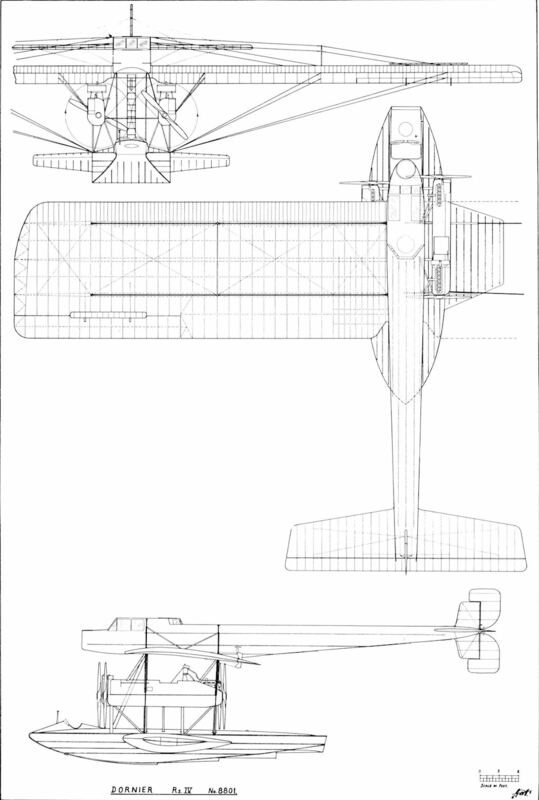 AEG R.1. A centrally-powered machine with four 260 h.p. Mercedes D.IVa engines. 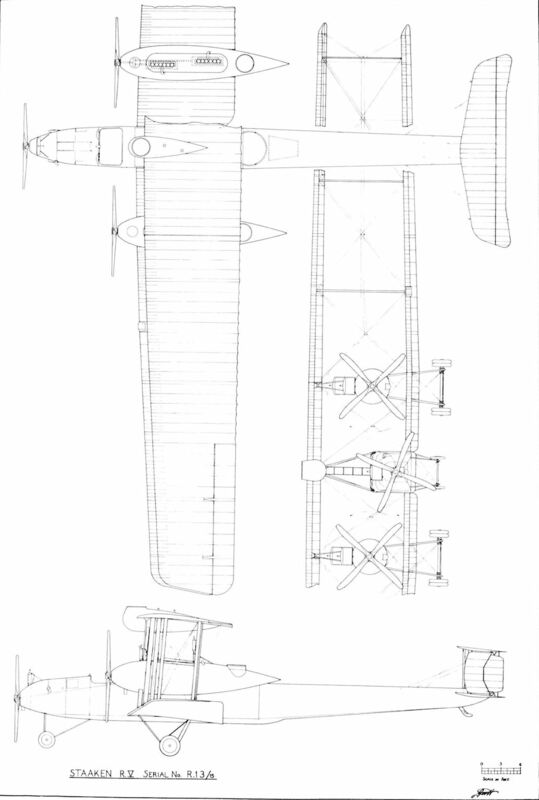 AEG R.I 21/16. 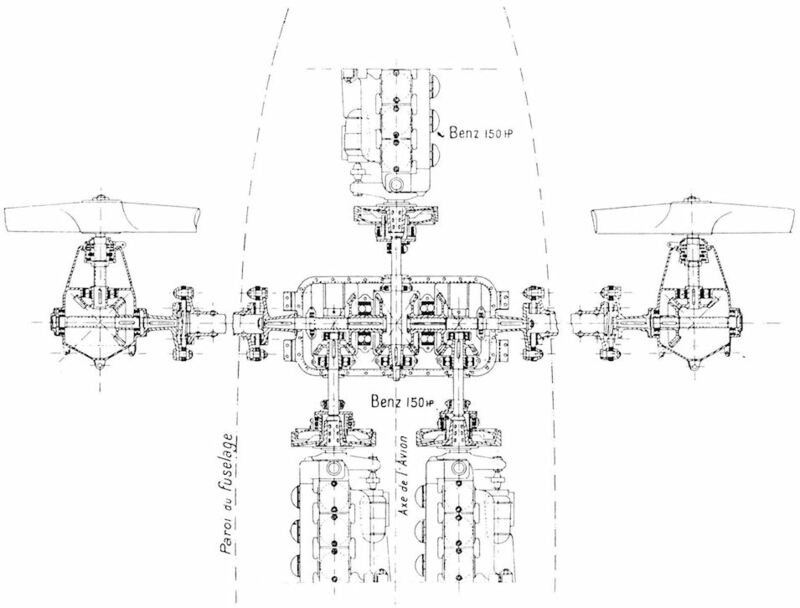 This illustration shows the redesigned dorsal crew positions of the final version. 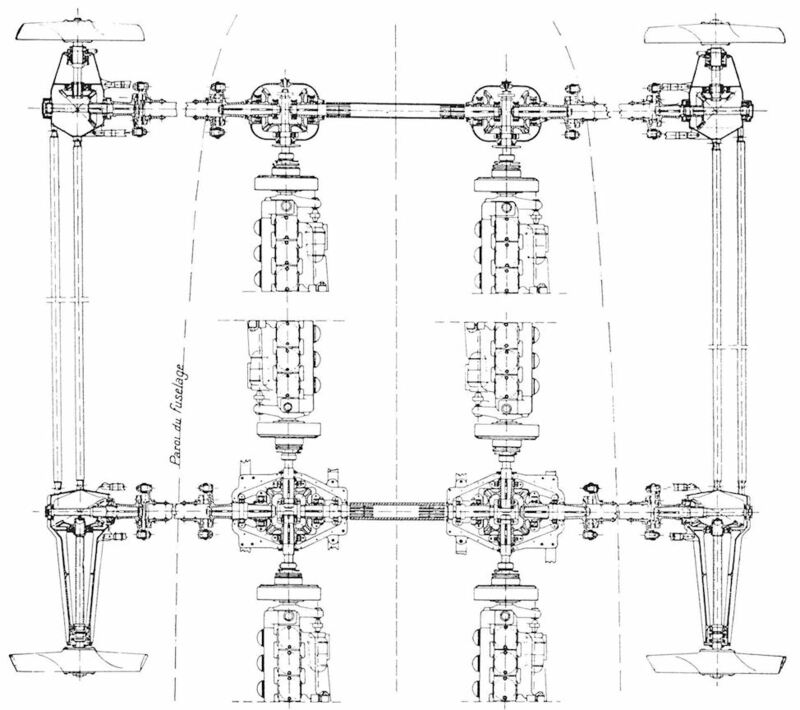 AEG R.I. Power transmission arrangement. 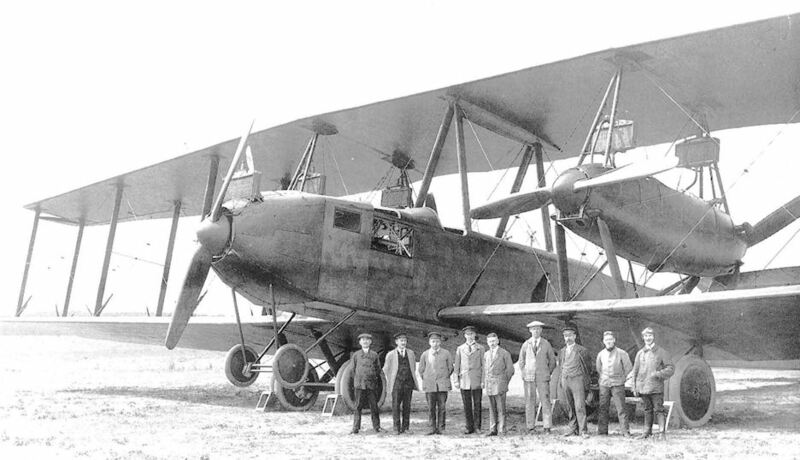 The Albatros G.l, experimental four-engined bomber built in 1915. SSW R.VIII. This was powered by six centrally located 300 h.p. Basse und Selve BuS.lVa engines. The great size of the SSW R.VIII is evident in the above view. The newly completed SSW R.VIII prior to leaving the assembly shed. 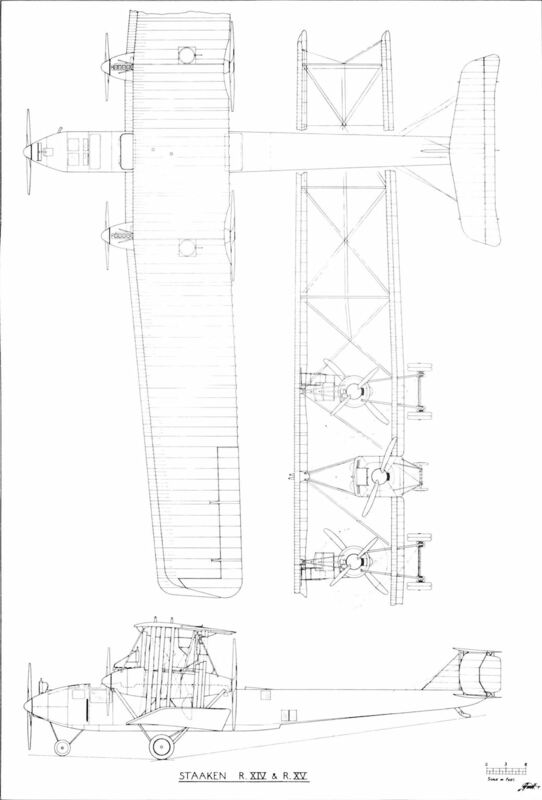 Tail unit of the SSW R.VIII 23/16. 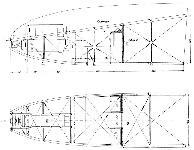 The fuselage of the SSW R.VIII shown ready for transport by road to Doberitz. Photo dated 17 October 1918. SSW experimental 1000 kg. wire-guided missile. Power for the controls was provided by the wind-driven generator mounted above the nose, behind which can be seen the container for the spool of guide wire. 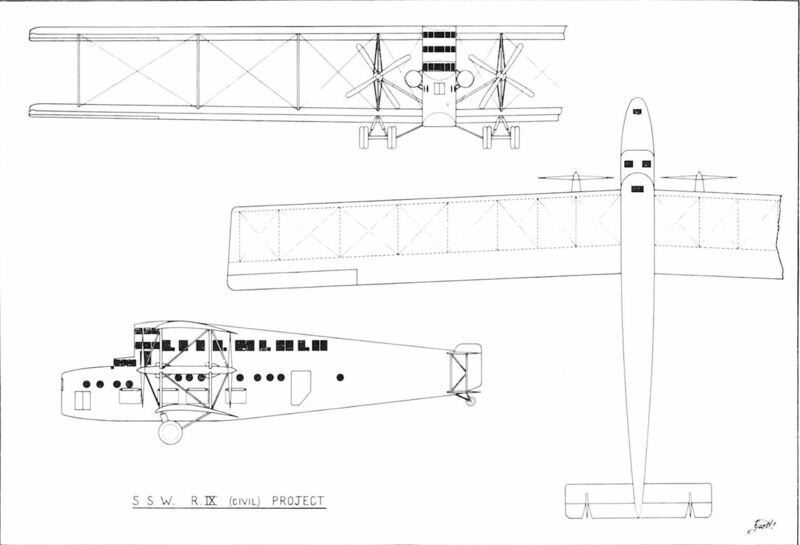 Early project drawing for the SSW R.VIII, dated 10 January 1917. 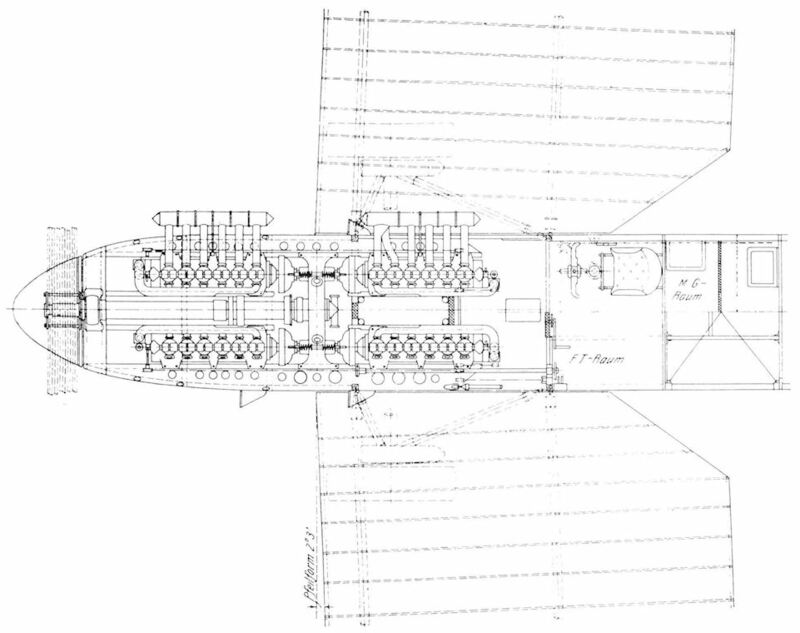 The aircraft is powered by four buried engines driving two tractor propellers and two untended pusher engines. 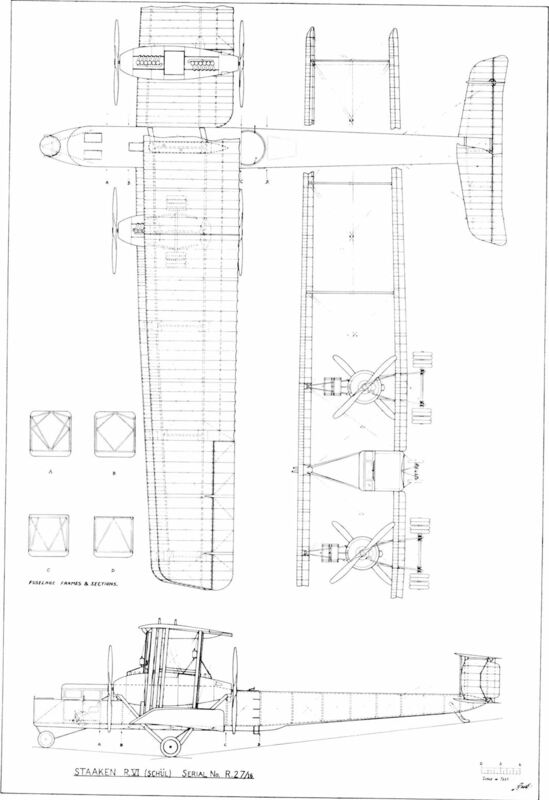 Internal layout of the SSW R.VIII. 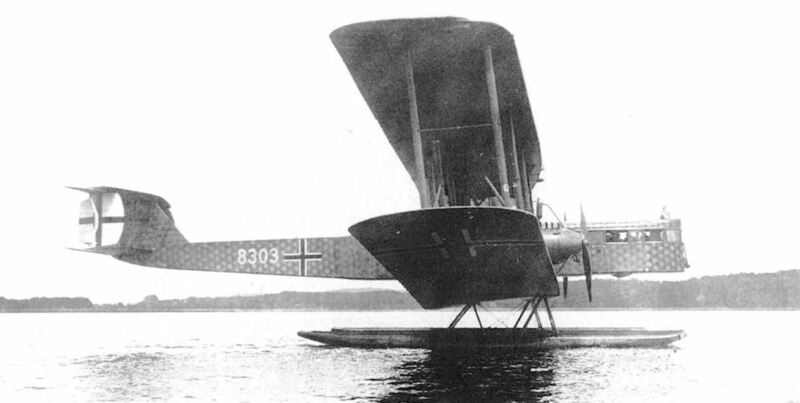 Staaken 8301 Seaplane during flight testing on the Havel at Potsdam. Although not officially accepted for naval service, the display of its marine number shows that this Staaken R (Riesenflugzeug) was ordered by the Navy and completed before the conditions of the Treaty of Versailles came into effect. 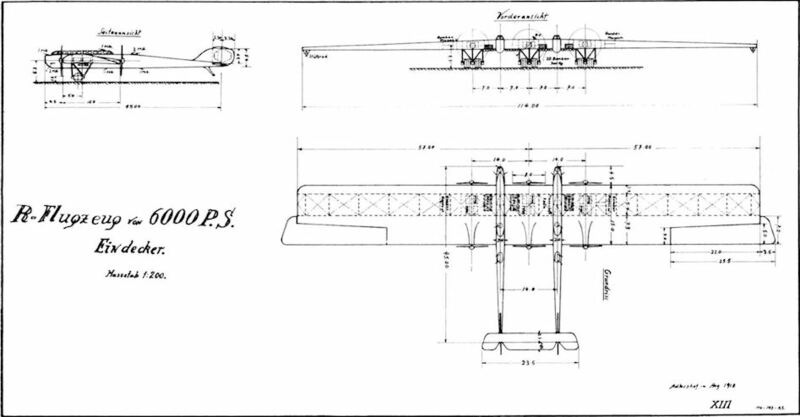 This machine shows the stage the Germans reached in the development of the giant twin-float seaplane by the end of hostilities. It was operated for a period on a regular basis, from the large lakes between Potsdam and Berlin to Travemiinde, taking Berliners to the seaside in what must have been the first holiday air traffic charters from that city. 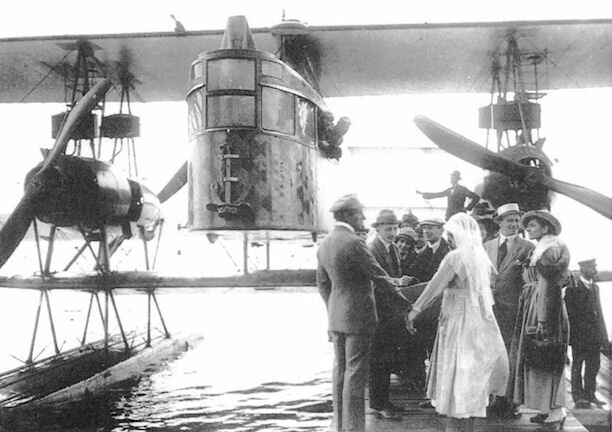 Staaken 8301 Seaplane with passengers, at the time it was operating week-end flights between Berlin and Swinemunde. The Staaken 8303 Seaplane taking off. 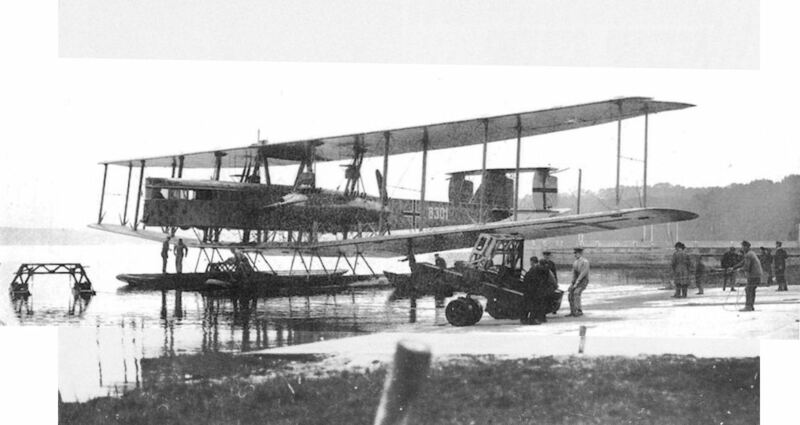 Staaken 8301 Seaplane fitted with wheels for the delivery flight to Potsdam. 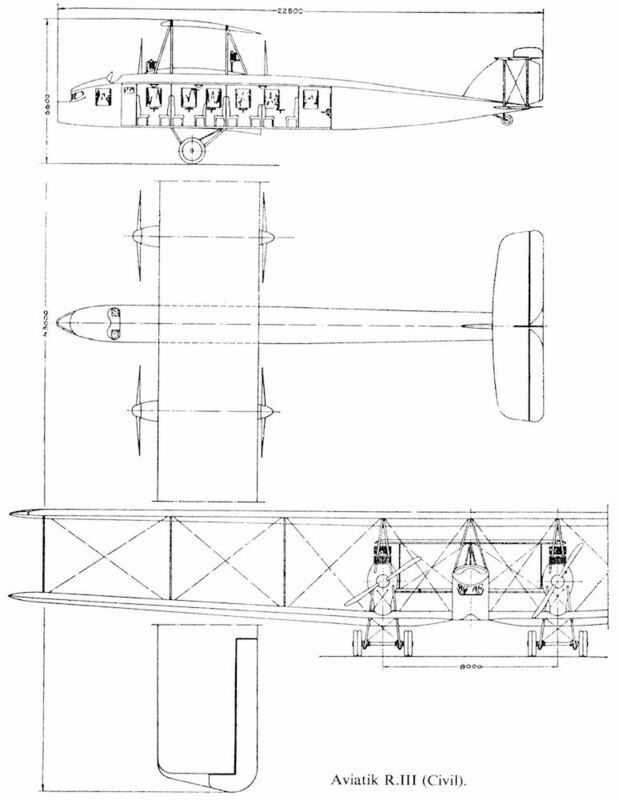 Initial flight form of the Staaken 8301 Seaplane. 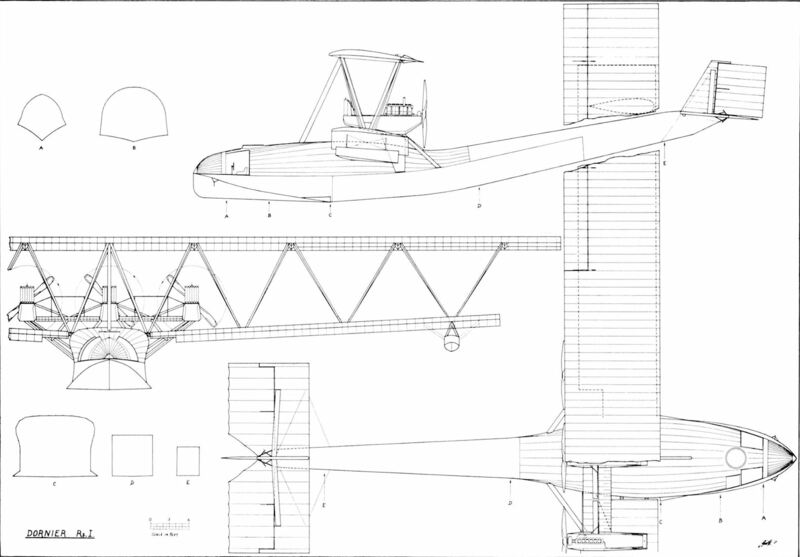 The single Zeppelin-Lindau Rs II giant, long range flying boat is seen here in its initial form with biplane tail. 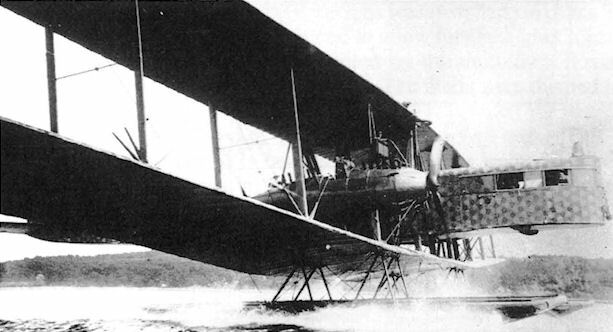 First flown on 30 June 1916 with its three 240hp Maybach Mb IVs buried within its short, broad-beamed hull, the problem of power losses in the transmission must have been serious, leading to the Rs II's beaching for modifications. 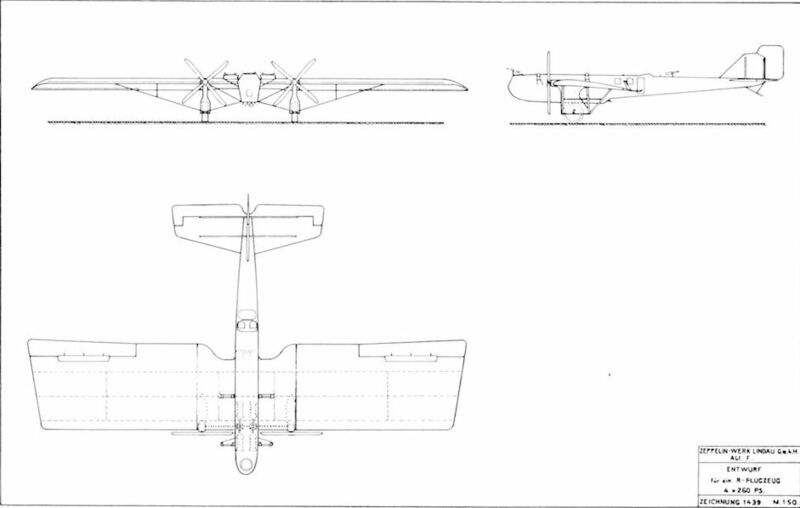 Centred around the engines, this work saw the replacement of the three buried units by four similar engines, now mounted between the hull and the parasol wing in twin push/pull nacelles, with each engine driving its propeller directly. The opportunity was also taken, at this time, to modify the machine's tail unit. 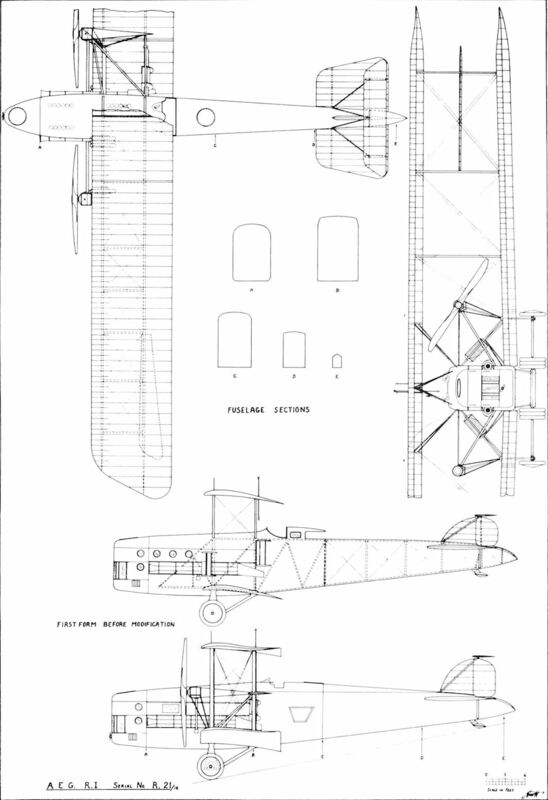 In this later form and known as the Rs IIb, the flying boat got airborne once more on 6 November 1916. 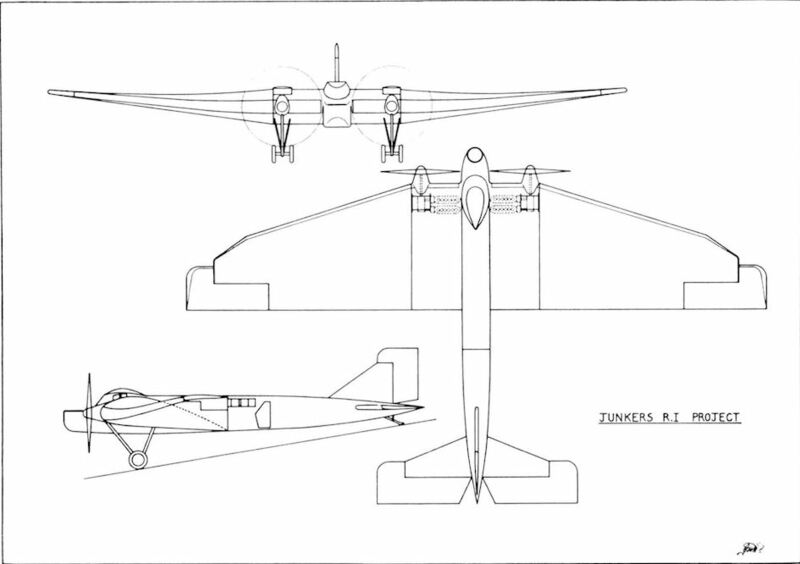 The Dornier Rs.II modified to have increased fin and rudder area, and employing tubular tail booms. 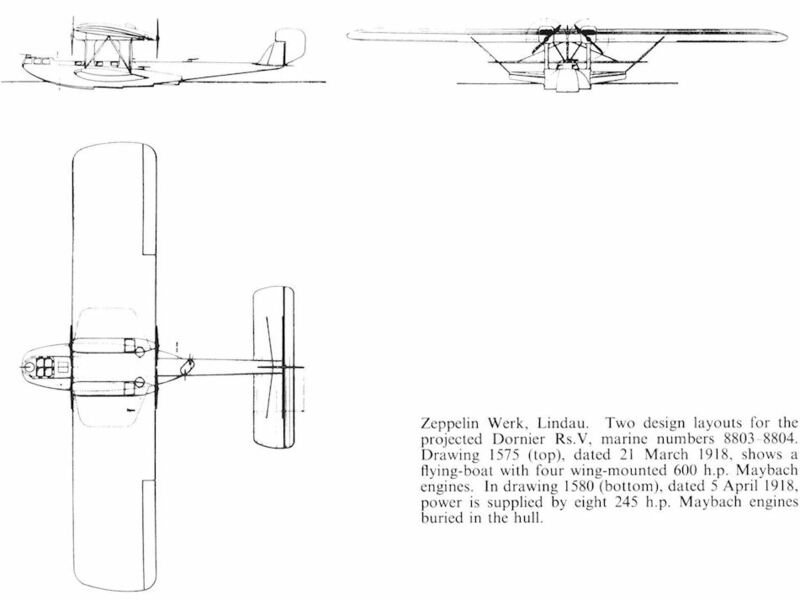 The Zeppelin-Lindau Rs IIb, seen here in almost final form and only awaiting its four 240hp Maybachs to be encased in drag-reducing engine nacelles. Capable of reaching 81 mph top level speed at sea level, the Rs IIb had, by now, elicited sufficient naval interest to have been bought and issued with the serial 1433. 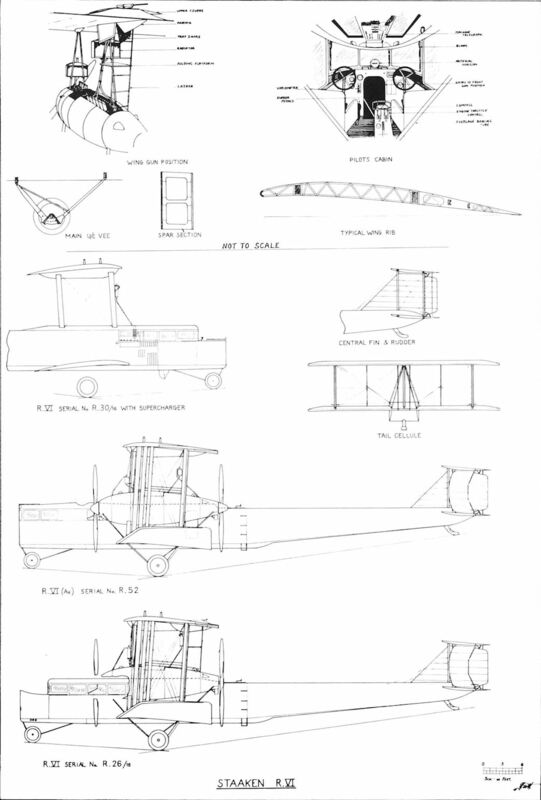 Following flight testing, the machine was dismantled so that parts could be used in its successor, the Rs III. 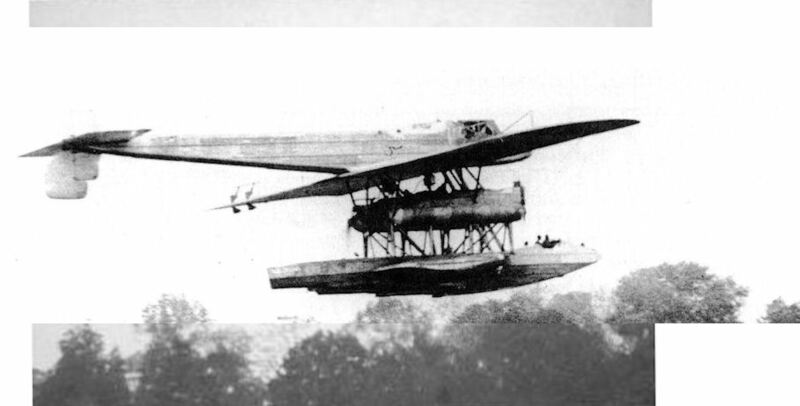 The Dornier Rs.II undergoing flight trials. 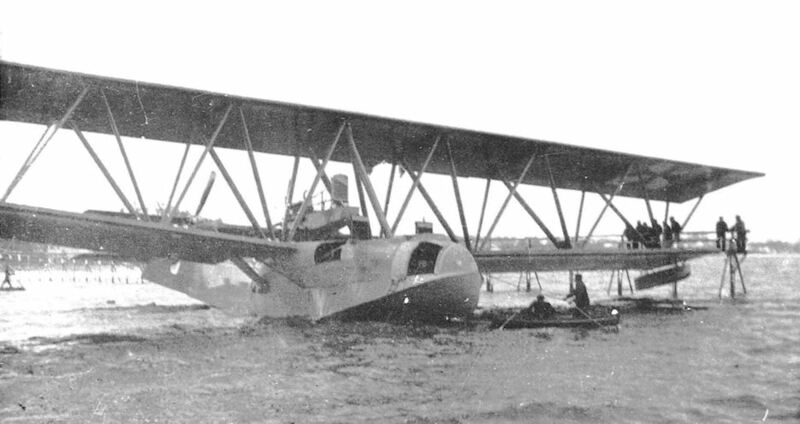 Dornier Rs.II taxying on Lake Constance. 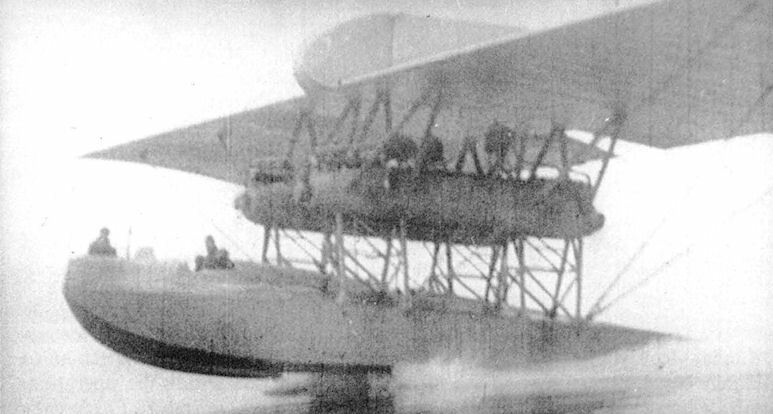 The final form of the Dornier Rs.II flying-boat. 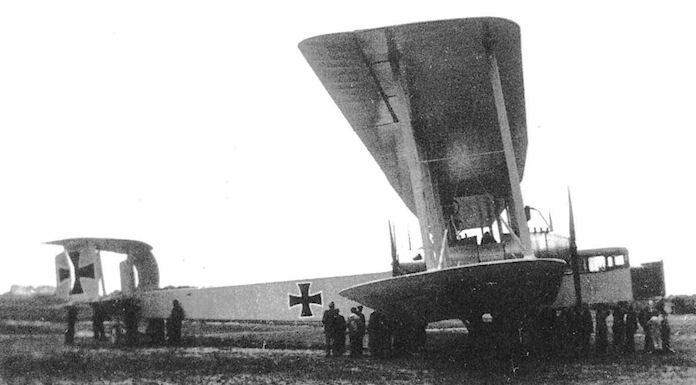 The Dornier Rs.II on the turntable at Seemoos. 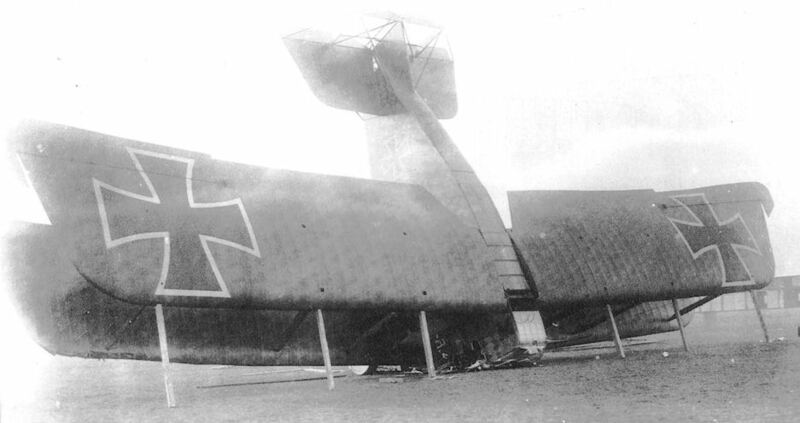 Dornier Rs.IV after a hard alighting buckled the fuselage, 12 October 1918. 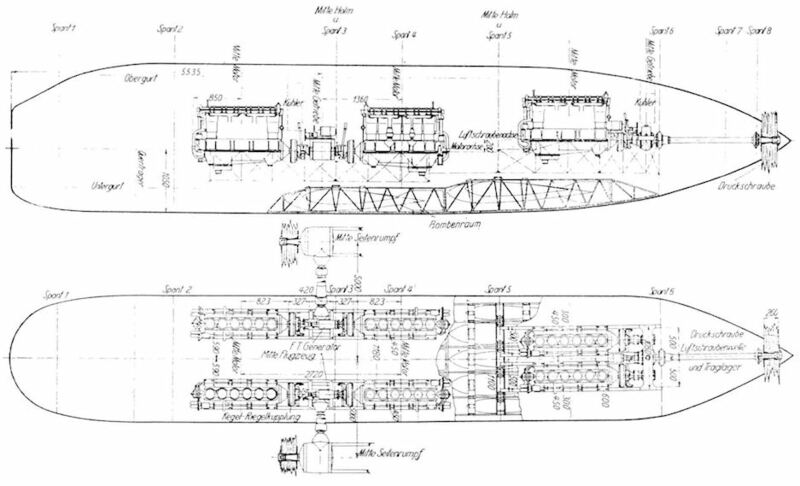 The Dornier-designed Zeppelin-Lindau RS IV turned out to be the ultimate wartime refinement of this series of giant, long-range flying boats. Carrying a crew of six, including a mechanic in each of the twin engined nacelles to tend the parasol winged machine's four 270hp Maybach Mb IVa powerplants. 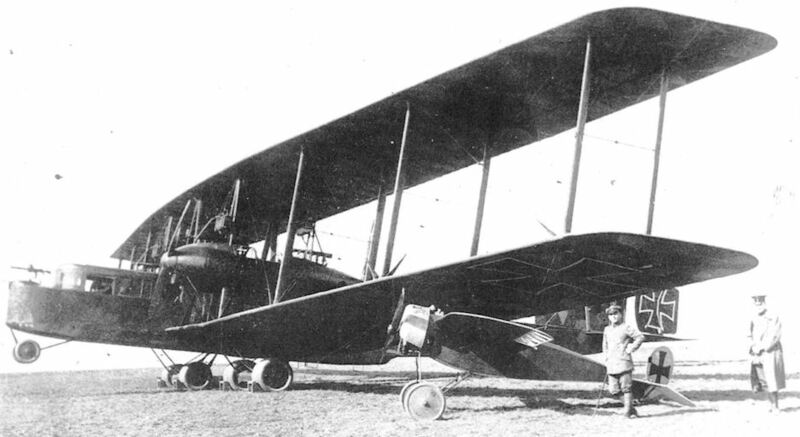 Flight testing, commenced on 12 October 1918, had hardly got underway at the time of the Armistice, with the result that much of the RS IV's estimated performance had yet to be explored. 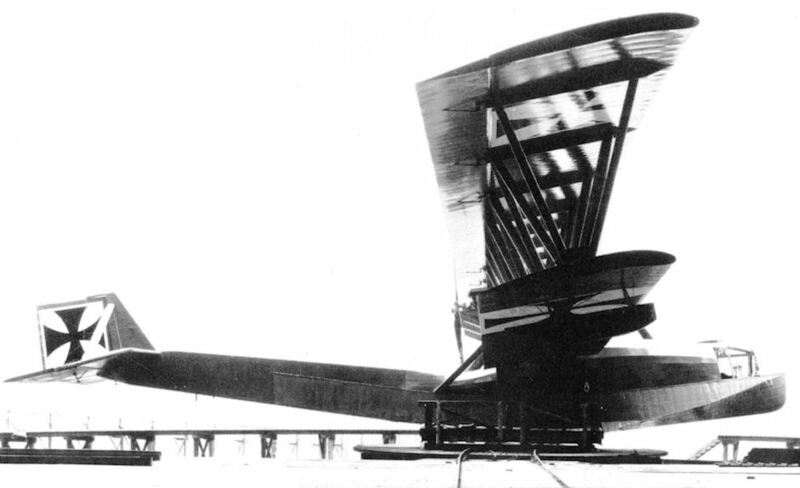 At the time flight testing ceased, the machine had achieved a top level speed of 86mph. 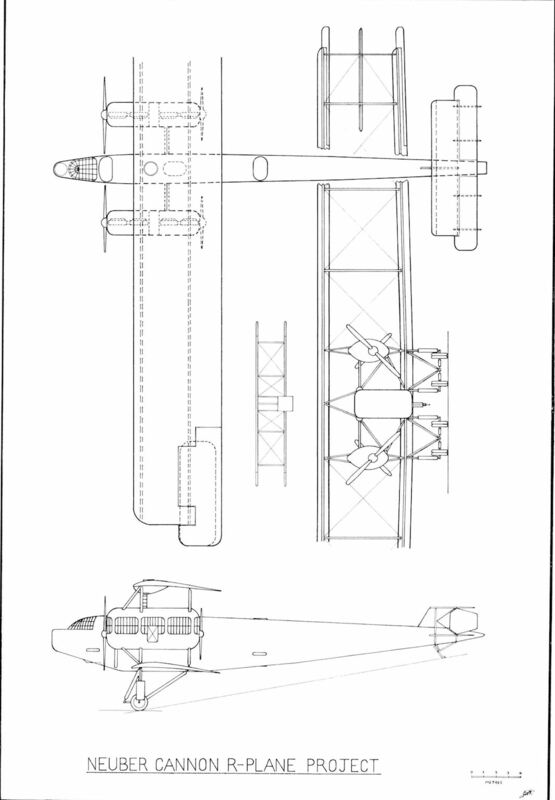 Significantly, many of the construction practices developed for these wartime designs, along with the characteristic push-pull tandem engine layout were to find their way into the post-war family of very successful Dornier long range flying boats, starting with the 8-tonne Wal and culminating in the elegant, four-engined Do 26. 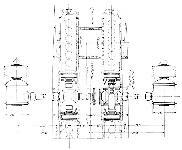 Factory drawing No.1488. 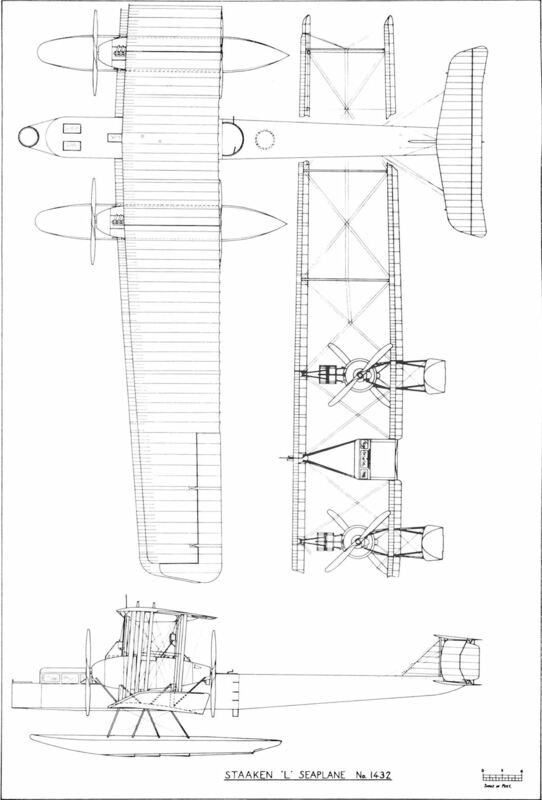 The first General Arrangement of the Rs.IV. Zeppelin Werk, Lindau. 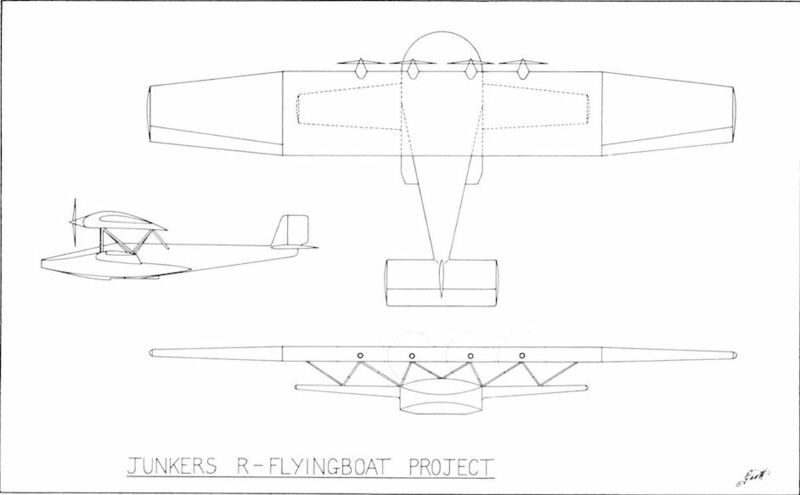 Two design layouts for the projected Dornier Rs.V, marine numbers 8803-8804. 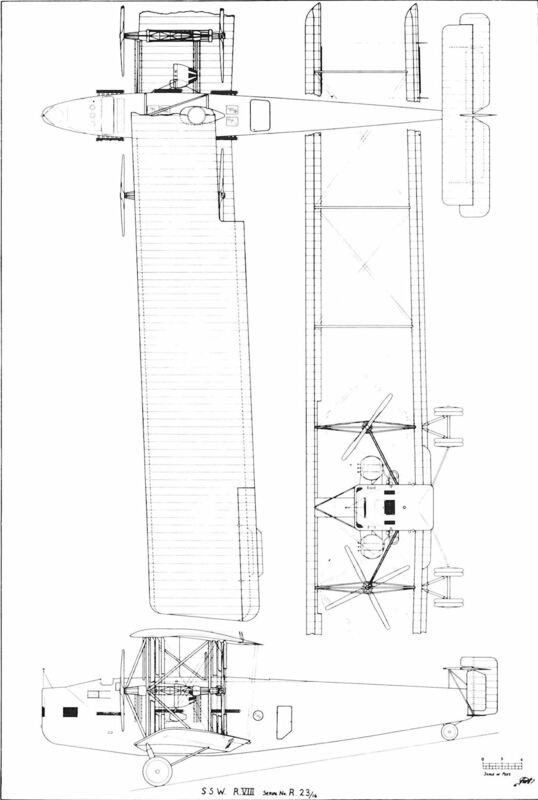 Drawing 1575, dated 21 March 1918, shows a flying-boat with four wing-mounted 600 h.p. Maybach engines. Zeppelin Werk, Lindau. 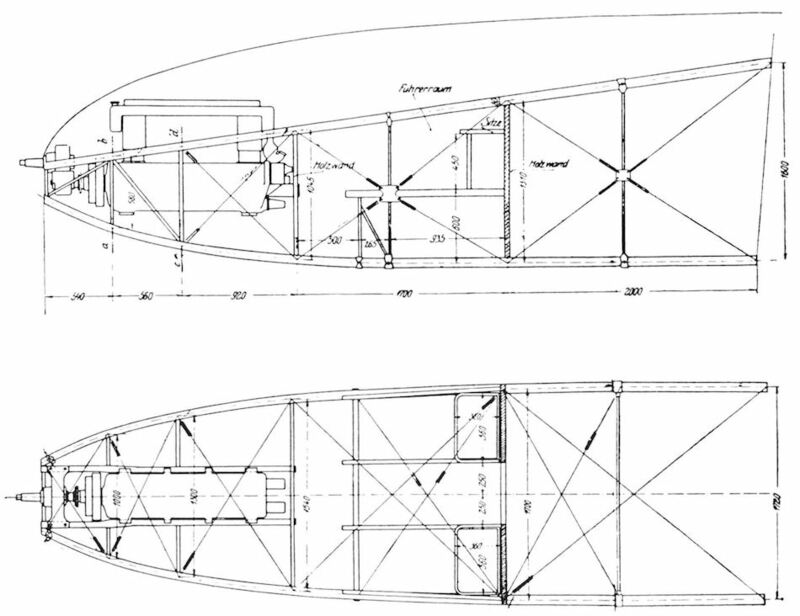 Two design layouts for the projected Dornier Rs.V, marine numbers 8803-8804. 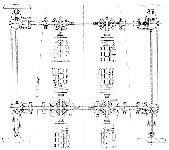 In drawing 1580, dated 5 April 1918, power is supplied by eight 245 h.p. Maybach engines buried in the hull. One of the huge wooden wheels of the Poll Giant and an interior view of the 9ft. 3in. 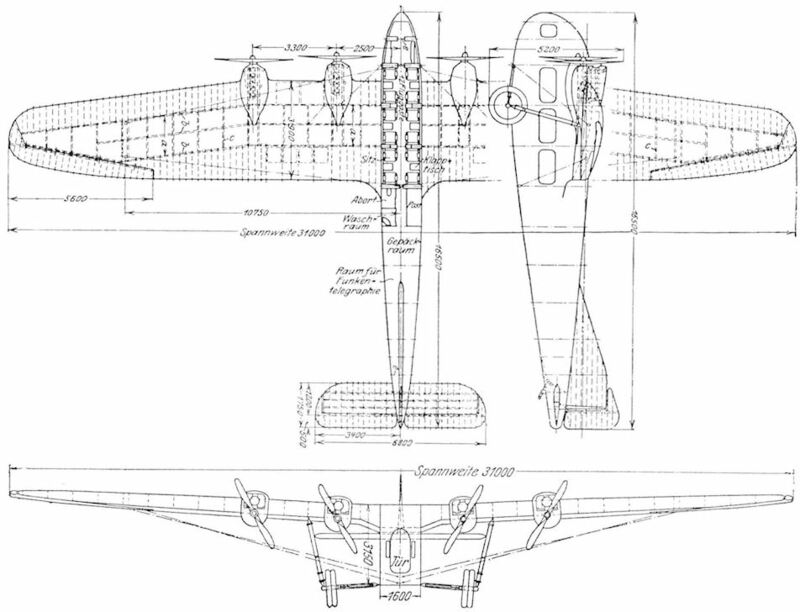 square fuselage. 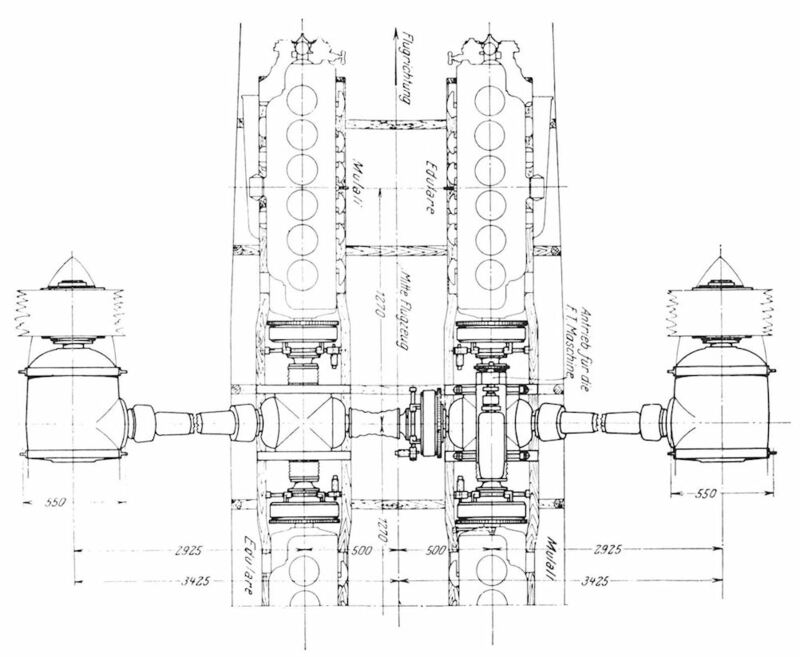 Schutte-Lanz R.I. Engine and power transmission arrangement. 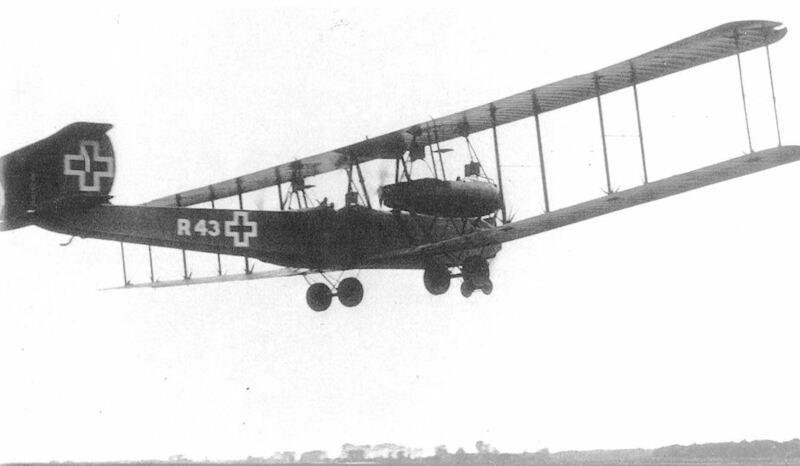 The SSW R.II in its original form in flight over Doberitz. 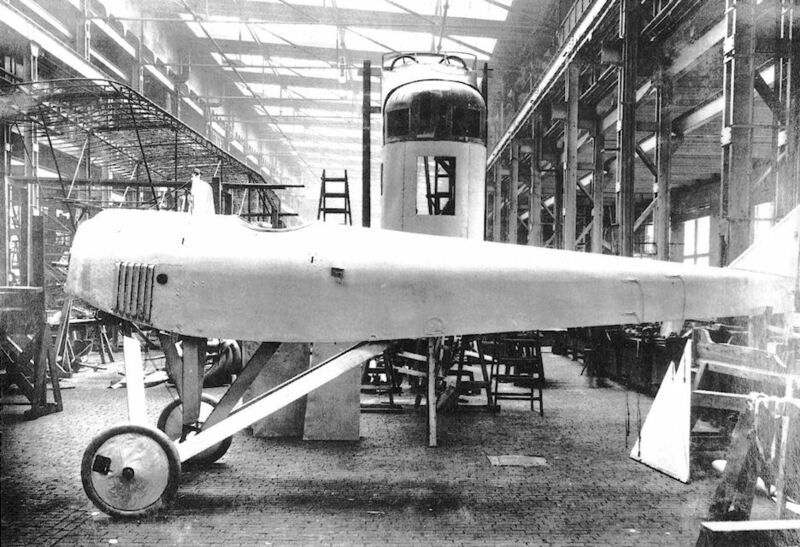 The SSW R.II 2/15 under construction at the SSW Dynamowerk. 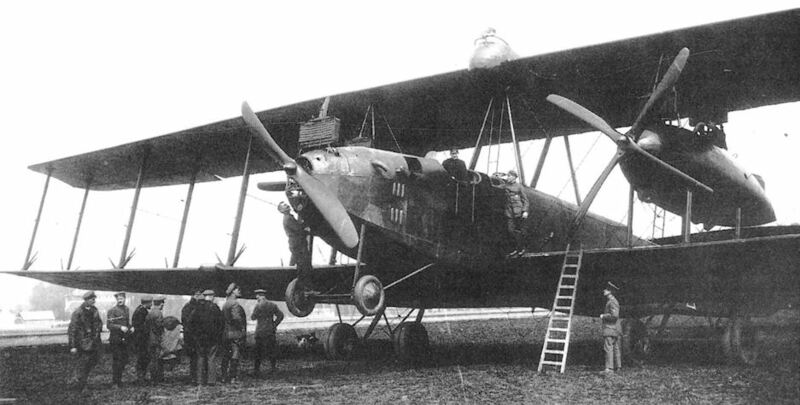 The only Siemens Schuckert-Werken R VI, 6/15, was delivered to the giant bomber operating Rf Abt 501, flying out of Vilna on the Eastern Front in late 1916. 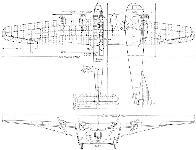 Powered by three 222hp Benz Bz IVs burried in the fuselage, these drove two oppositely rotating propellers via a complex web of right-angled power take-offs and transmission drives. 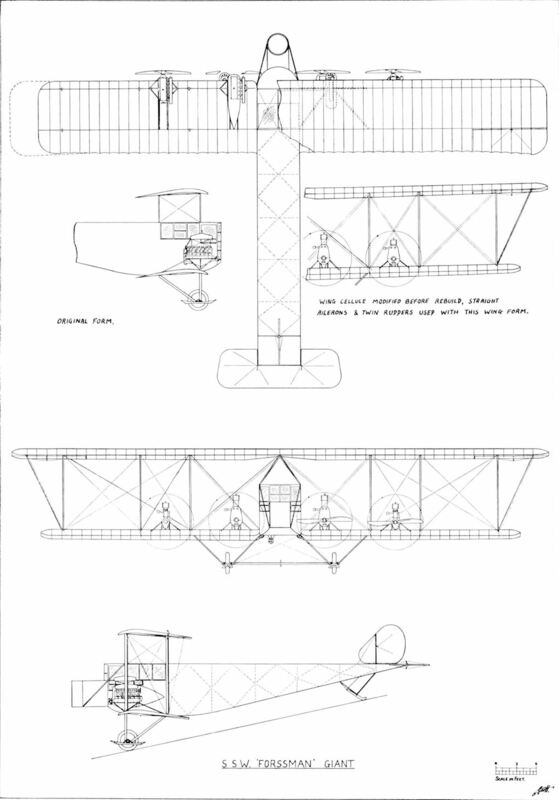 A key characteristic of this six-man machine was that its twin boom fuselage was arranged with the booms one on top of the other, rather than being set out side by side in the normal fashion. The top level speed of the R VI was 80.8mph, while its optimum range was 323 miles. 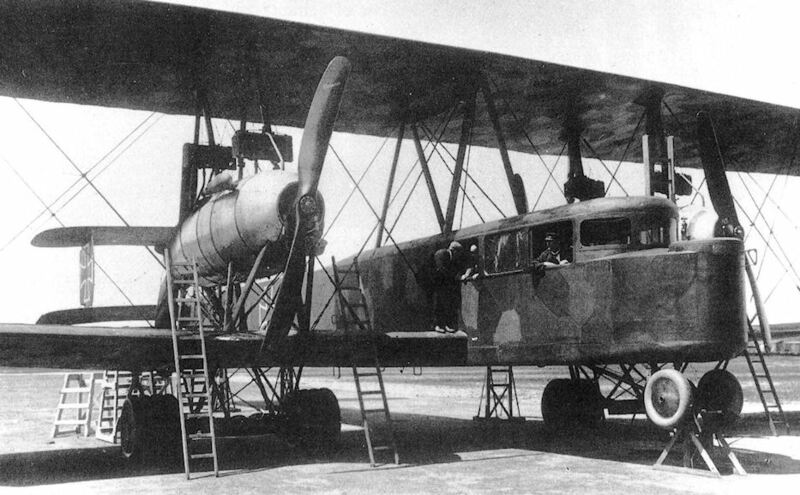 The rebuilt SSW R.II 2/15 with night camouflage applied. 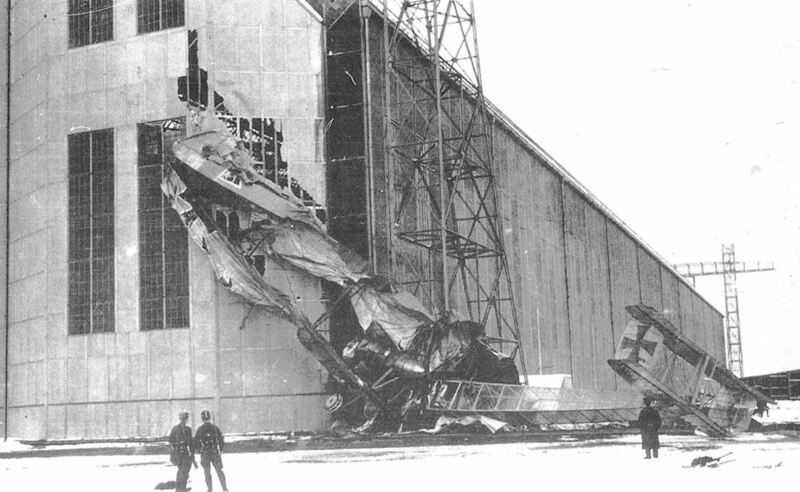 The final crash of the SSW R.2. SSW R.IV 4/15, on the occasion of an inspection of Rfa 501 by General von Oven at Lyntupy. 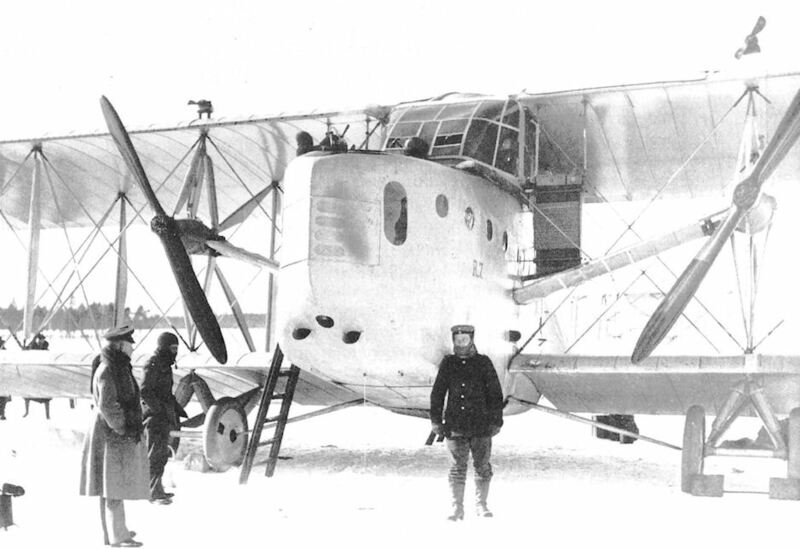 The SSW R.V 5/15, which flew operationally with Rfa 501 at Vilna. SSW R.V 5/15 on the Rfa 501 airfield at Alt-Auz. 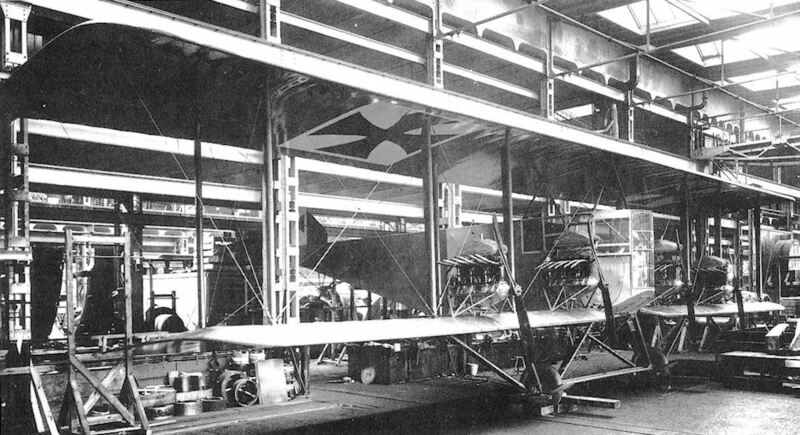 After the above incident in February 1917, the damaged SSW R.5 was dismantled to provide spares for the remaining SSW R-planes. 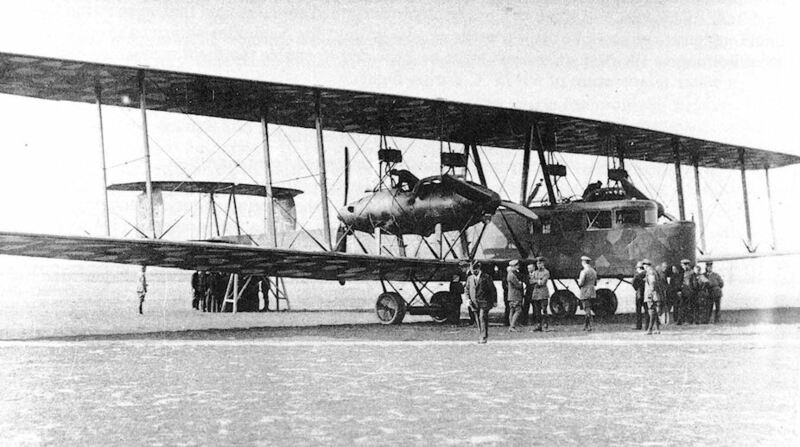 SSW R.VI 6/15 at Kowno in August 1916. Emergency landing by the SSW R.VI 6/15 in a ploughed field near Vilna, December 1916. 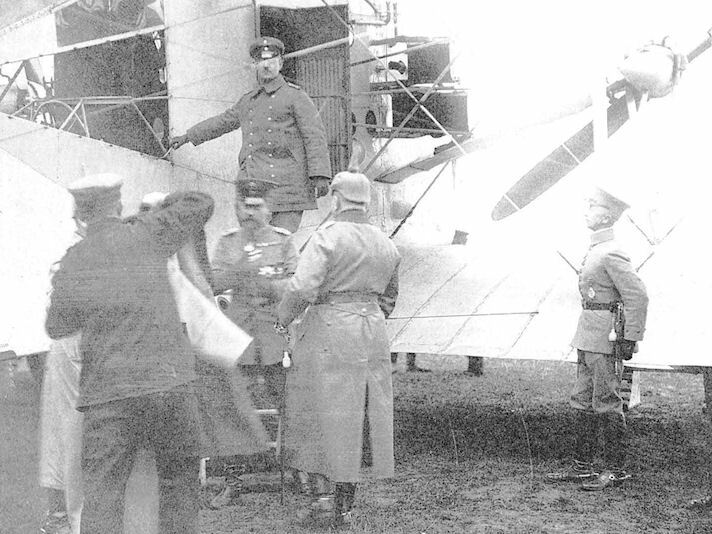 Prince Leopold IV of Lippe leaving a SSW R-plane during a visit to Rfa 501 at Porubanok, summer 1916. 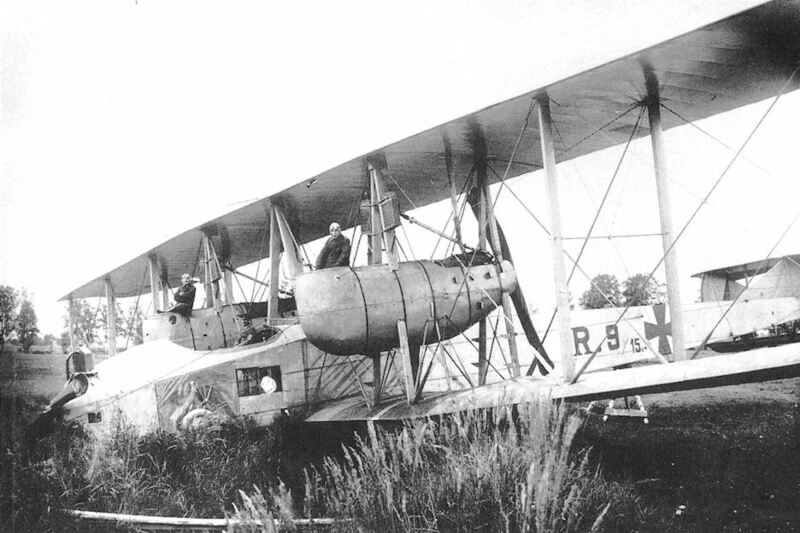 SSW R.VII 7/15, in service with Rfa 501 against the Russians during 1917. 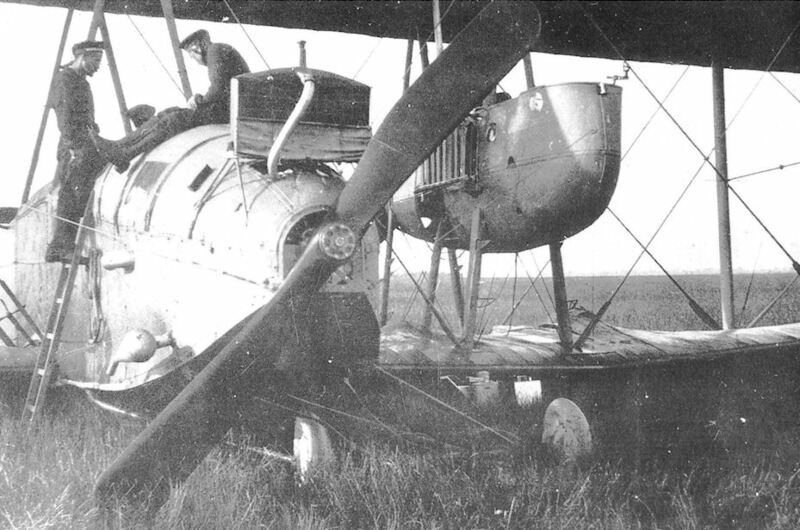 "Сименс-Шуккерт" R-VII на аэродроме Альт-Ауц, март 1917 г.
SSW R.VII 7/15 on the Rfa 501 airfield at Alt-Auz. 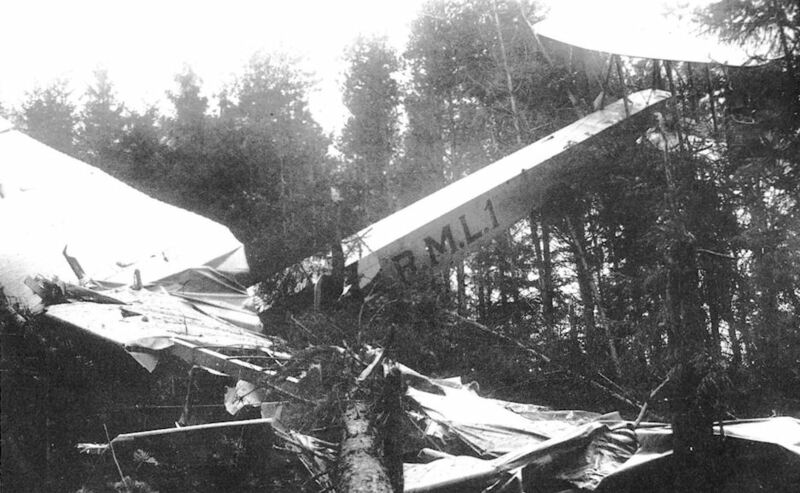 This photograph shows the SSW R.7 crashed at Vilna. 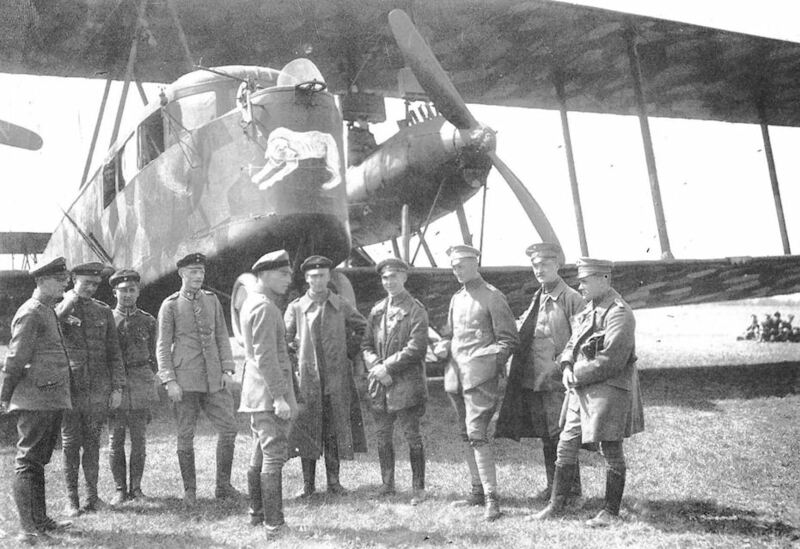 British officers standing in front of the wreckage of a SSW R-plane at Cologne airfield after the Armistice. 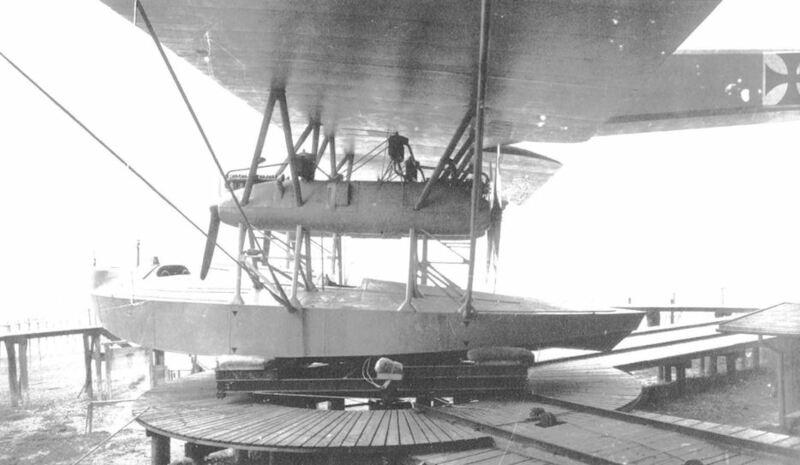 The VGO.III shown fitted with aileron balancing surfaces attached to the rear struts. From left to right: Hans Baumeister, Anton Diemer, Foreman Ridlein, Gustav Klein, Grimmeisen and Boenisch. 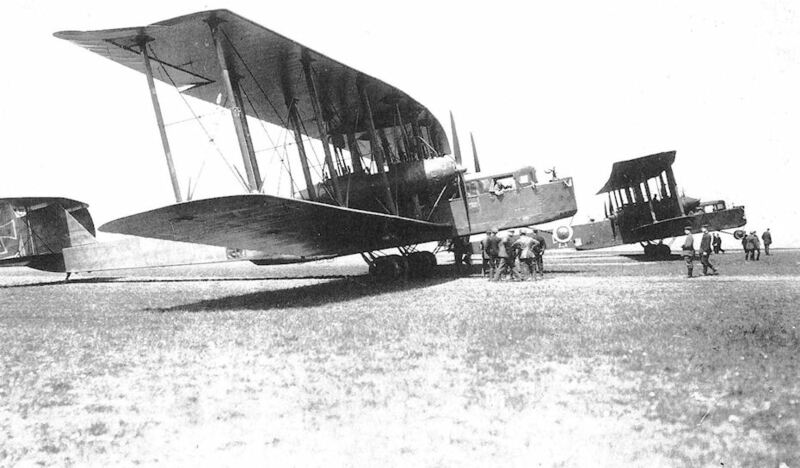 The sole giant Zeppelin-Staaken VGO III, 10/15, went into service with Rf Abt 500 based near Riga in Latvia in 1916, making its first operational sortie on 13 August 1916. Power for the VGO III was provided by six 160hp Mercedes D IIIs, paired to drive the nose-mounted tractor propeller, plus the two outboard pusher propellers. 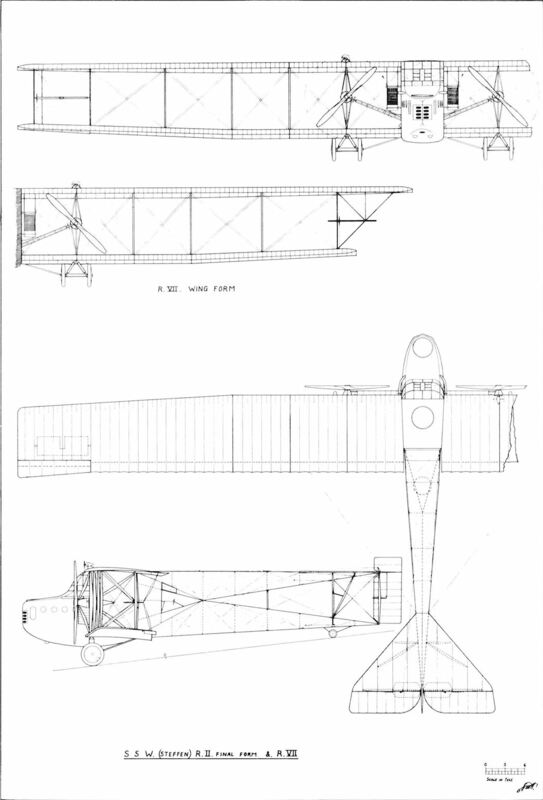 With a wingspan of 42m, or 137.8 feet, the VGO positively meandered along with a top level speed of 75mph. 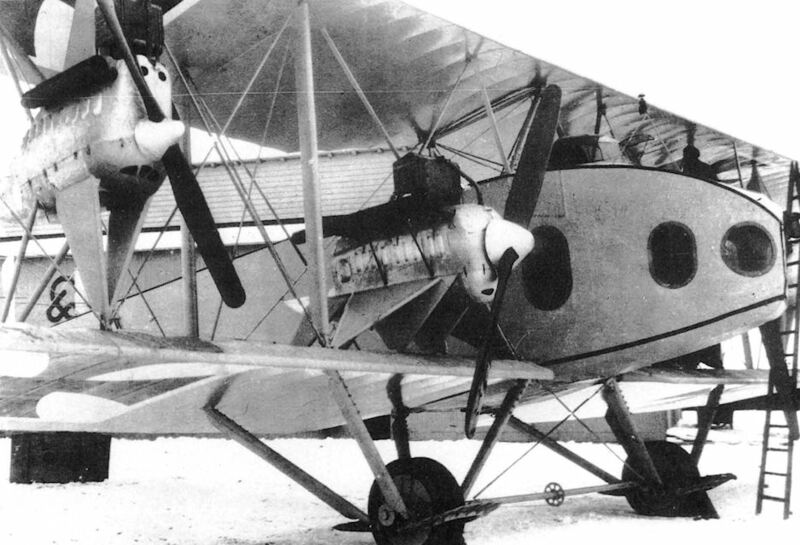 Sadly, the pilot responsible for coaxing the VGO III through her teething troubles, Oblt Hallen, Baron von Hallerstein was to be killed exactly three months after taking the VGO III on its first operational mission, while flight testing the lethally tail-heavy Zeppelin-Lindau V.I fighter. 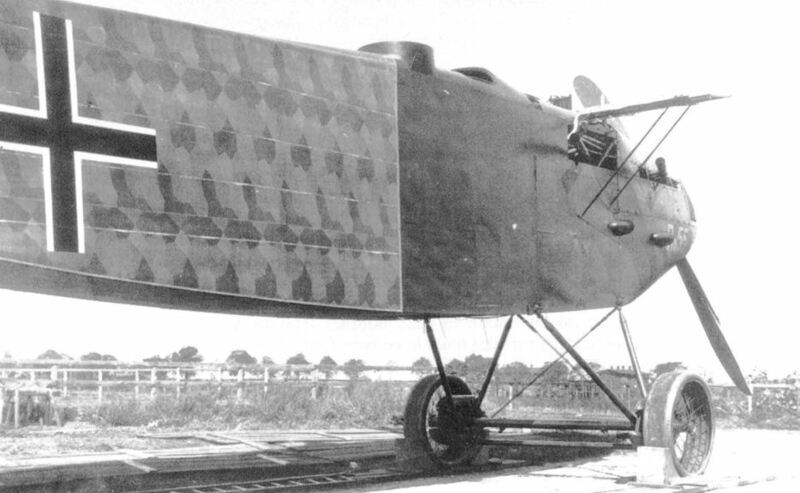 The VGO.III is here shown resting all its tailskid; the more normal attitude was for it to rest on its nose wheels with the tail high. 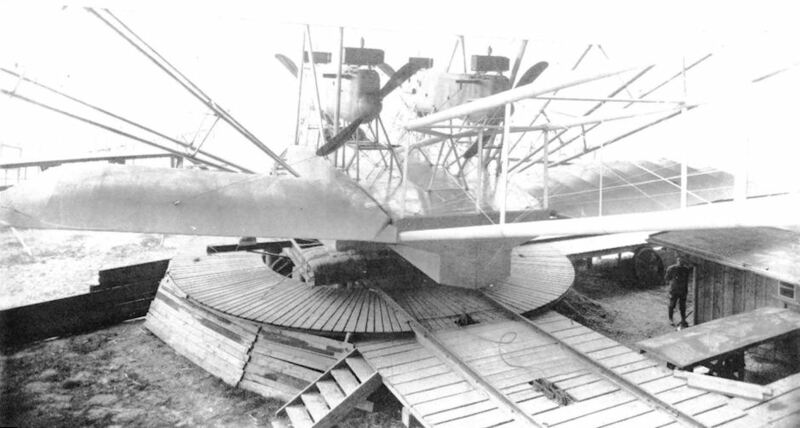 Only minor damage was sustained by VGO.III during a forced landing, date unknown. 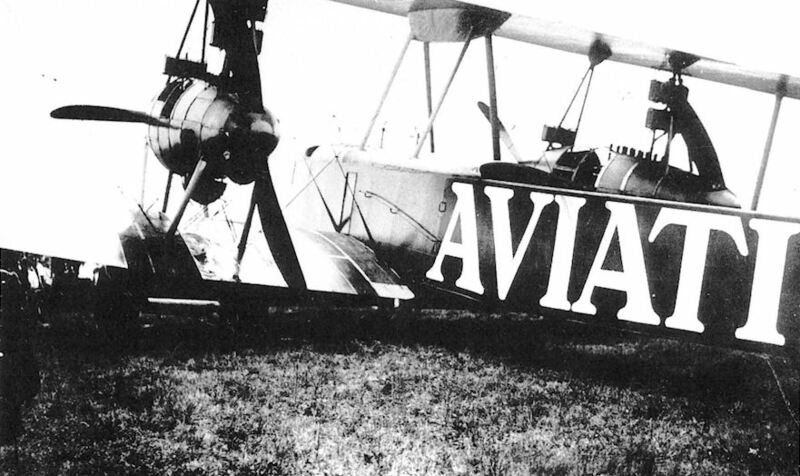 The VGO.III on the tracks outside its hangar at Alt-Auz, summer 1916. 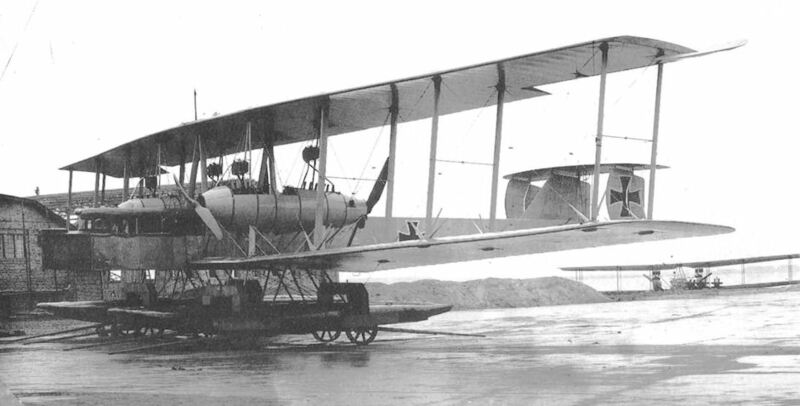 The VGO.III, 8 September 1916 on delivery to Rfa 500. 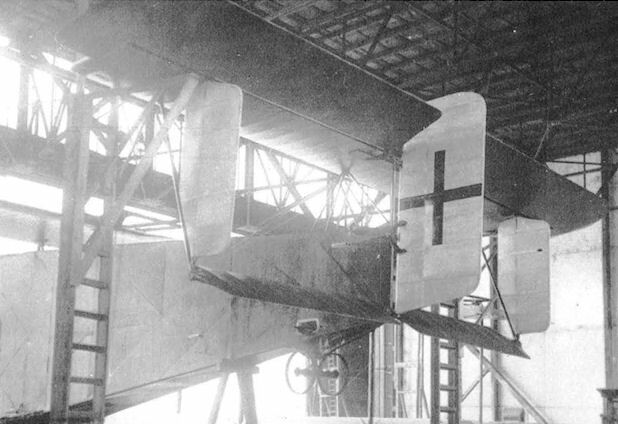 The Staaken R.IV prior to the fitting of upper wing armament. 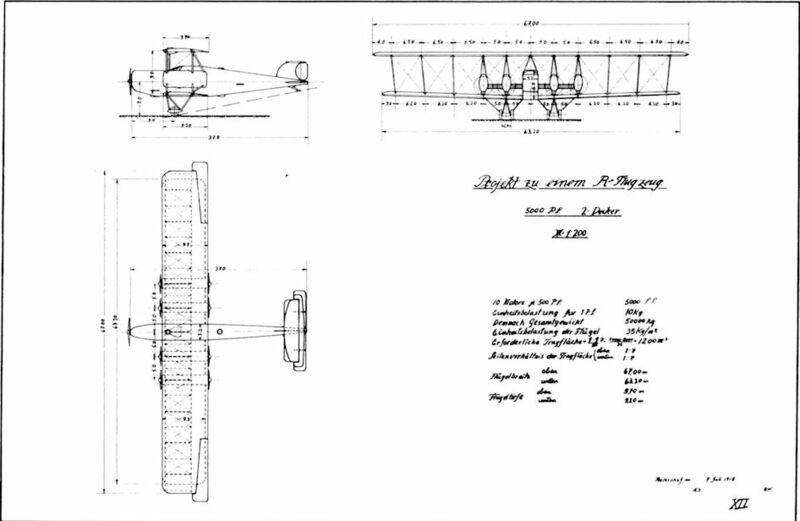 The form in which the Staaken R.IV 12/15 first flew. 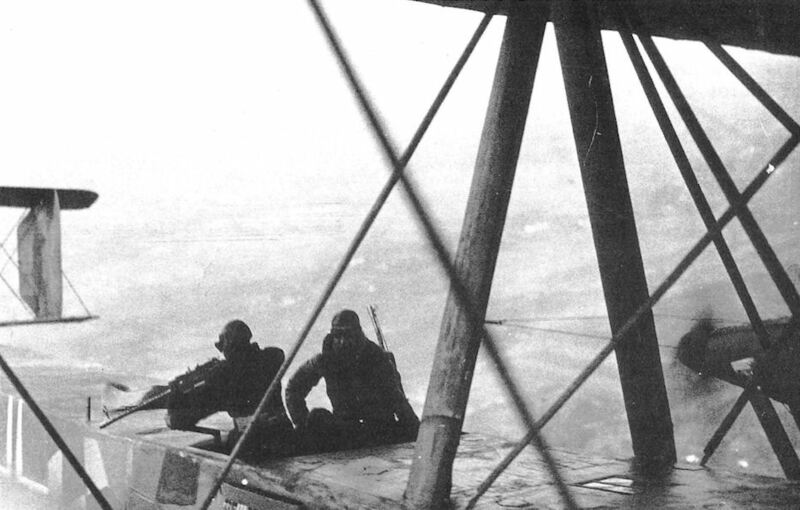 Dorsal gunner's position on the Staaken R.IV. ON BOARD A GERMAN GIANT AEROPLANE. - The mechanic is repairing an oil pump defect during flight. The photograph was taken from the port engine nacelle. 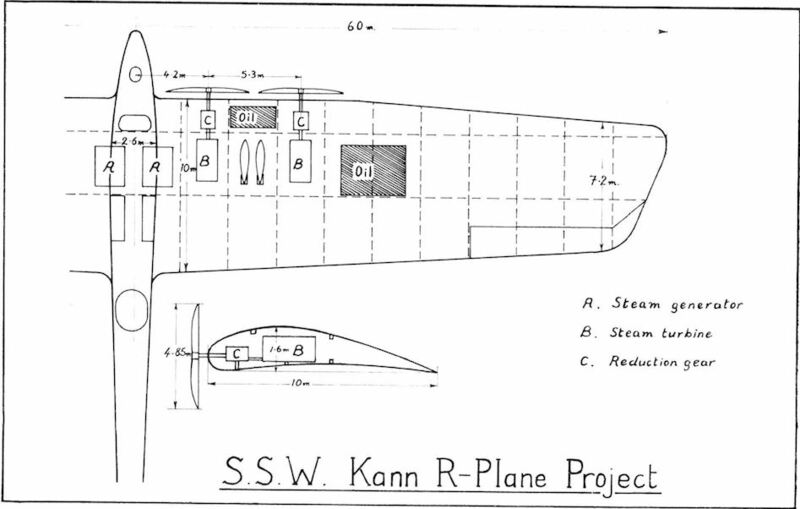 Port nacelle of the Staaken R.IV. 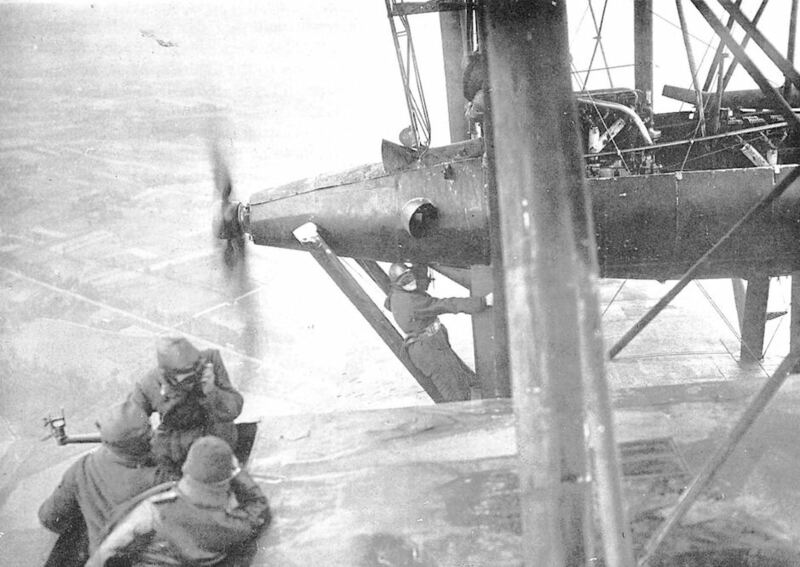 This view shows mechanic in attendance during flight. 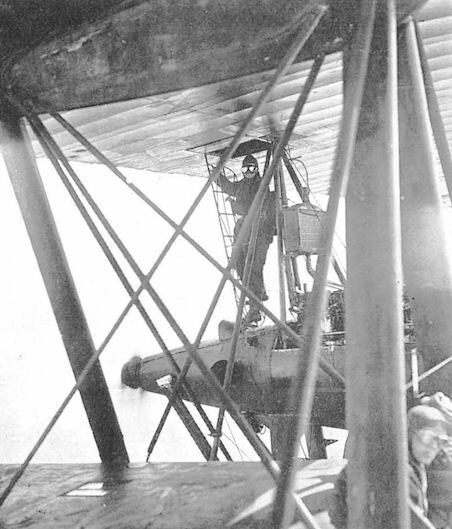 Member of the crew of the Staaken R.IV ascending to the upper wing gun platform. 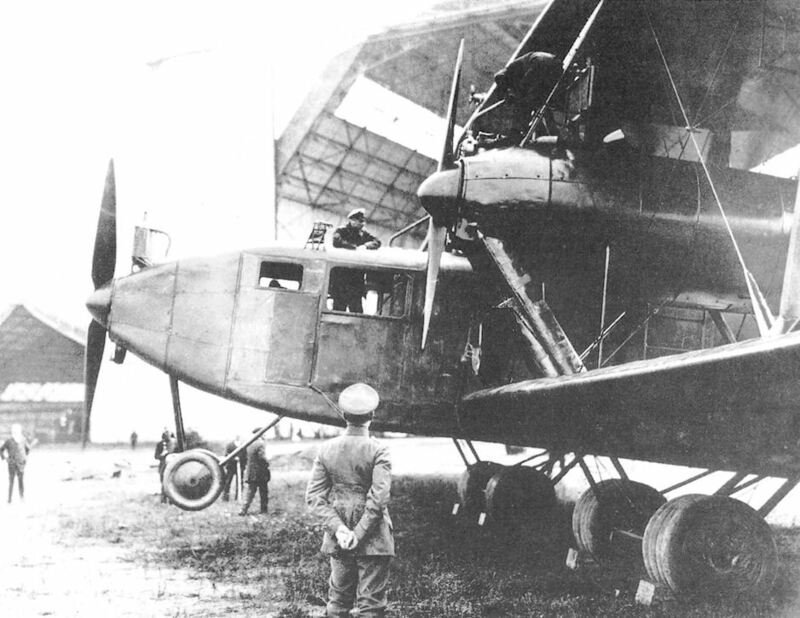 The engineers looking out of the forward eingine-room (engineer compartment) window of German five-engined "Giant" aeroplane Staaken R.IV. 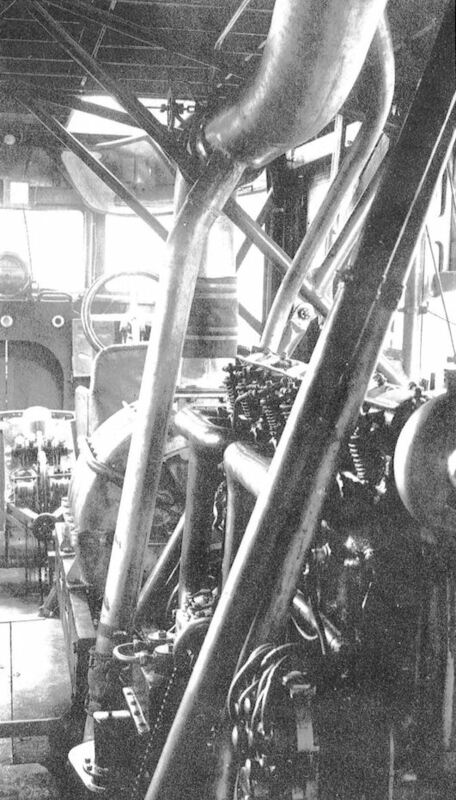 Mechanics working in the port engine nacelle of the Staaken R.IV 12/15. 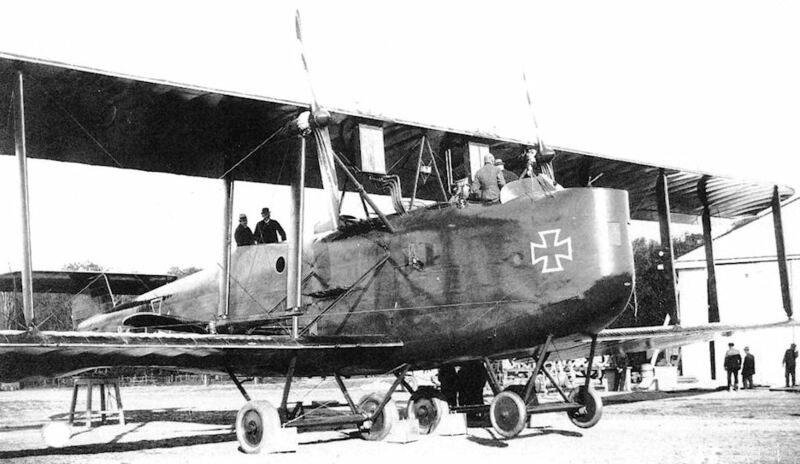 Staaken R.IV 12/15, here seen at Alt-Auz early in its long operational career. 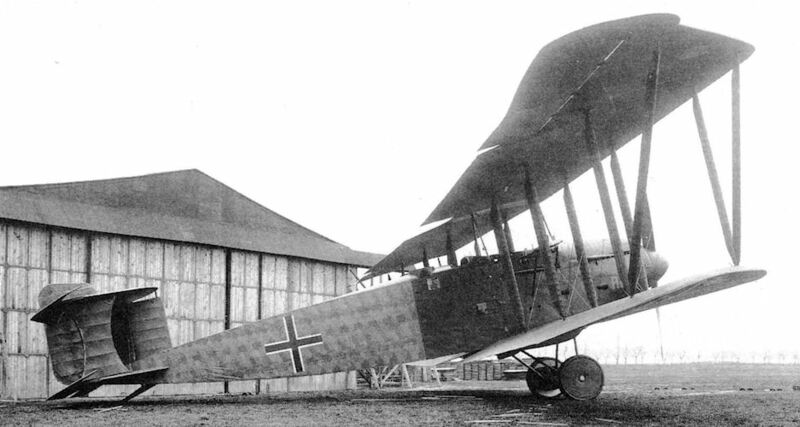 Staaken R.IV 12/15 in night camouflage on the Scheldewindeke airfield. 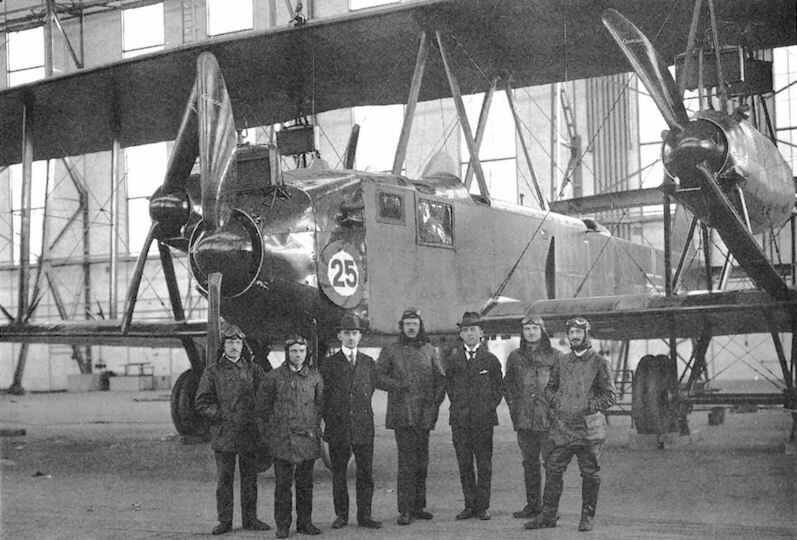 The Staaken R.IV and its crew at Kassel after the war. 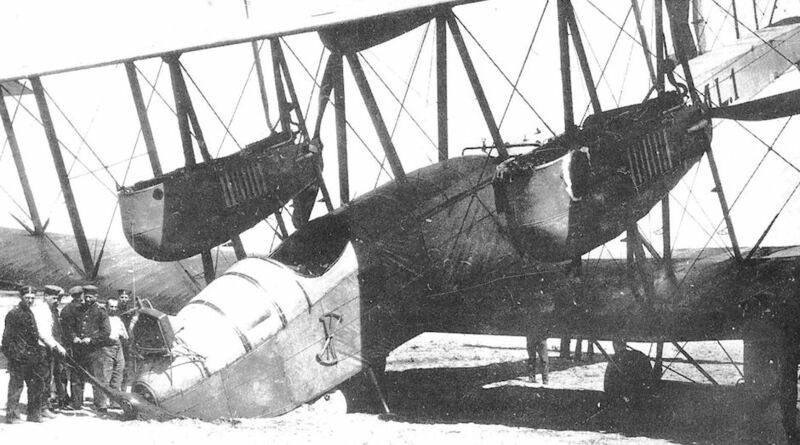 The targets attacked, the total weight of bomb dropped and places flown to have been chalked on the fuselage side. 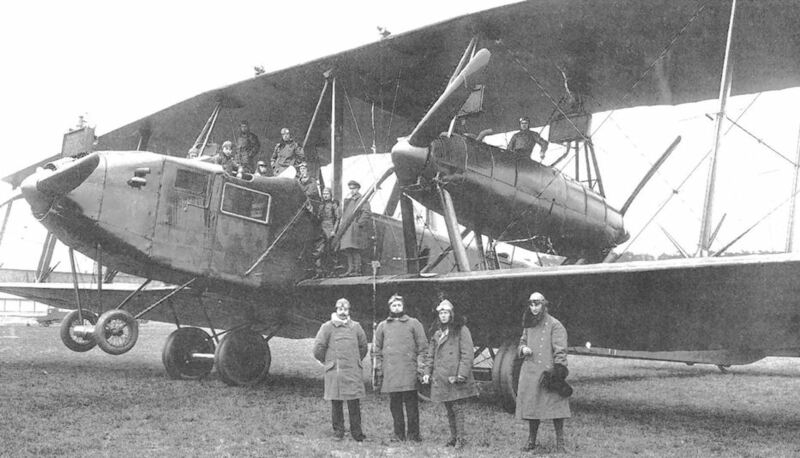 The Staaken R IV 12/15 had the longest operational career of any machine in the R category, and was the only one to be flown on both the Eastern and Western Fronts, from May 1917 until the Armistice. 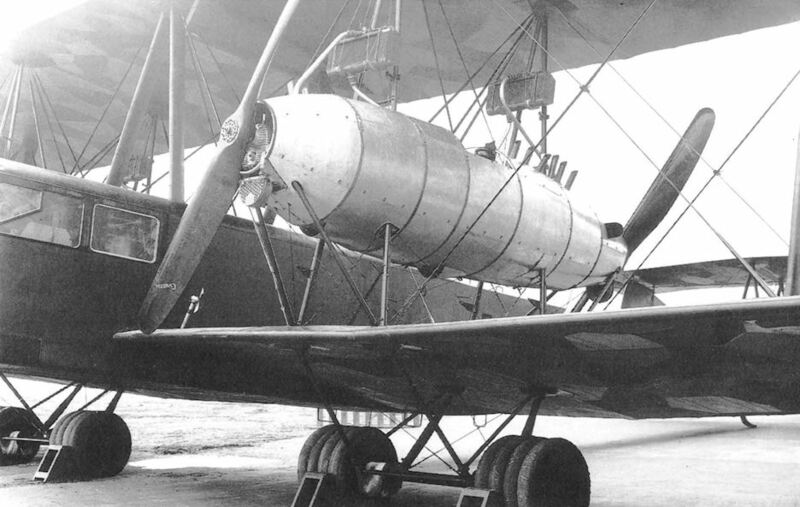 It survived a collision with a balloon cable over London in February 1918 and dropped a total of 25,000kg of bombs. 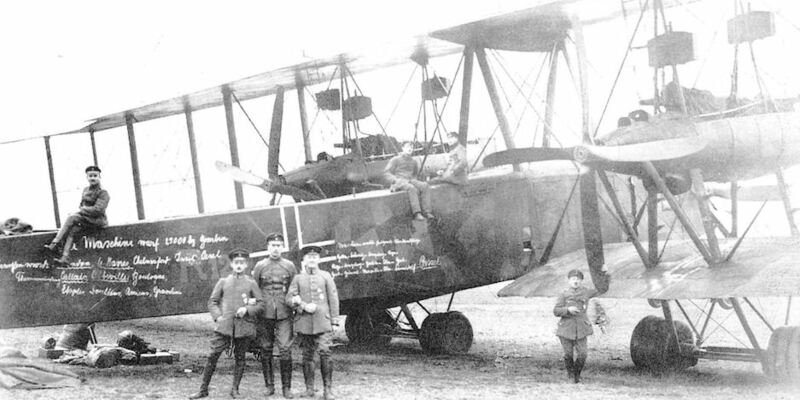 It is seen at Kassel in April 1919 with its fuselage inscribed with the names of the main targets attacked (including London, Harwich, Chelmsford, Oesel Island (Baltic), Calais, Abbeville, Boulogne, Etaples, Doullens and Amiens) and the routeing of several long-distance flights occasioned by ferrying from one theatre of operations to another; eg, Gotha-Doeberitz-Koenigsberg-Riga. 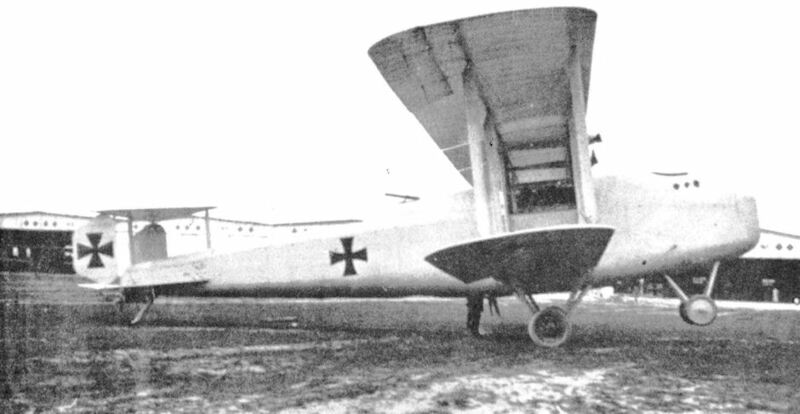 The Staaken R.IV 12/15, at Kassel, April 1919. Staaken R.lV 12/15. The only R-plane to see action on both the Eastern and Western Fronts. Late style markings on be seen painted over the old Patee crosses which still faintly show through. 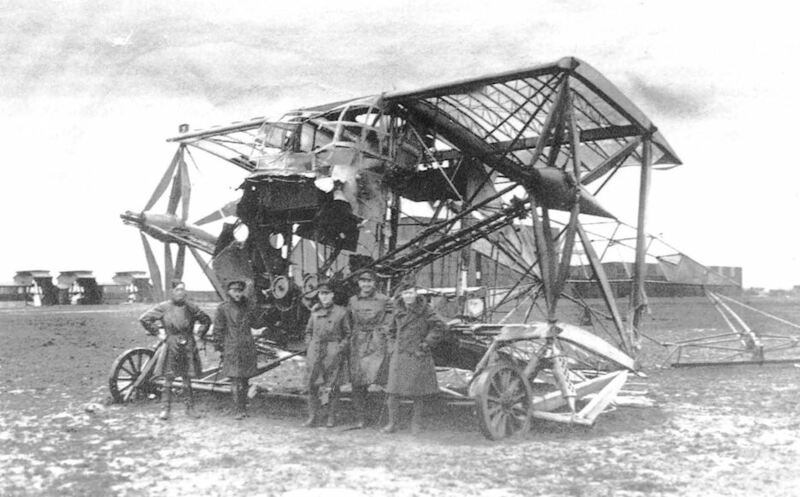 Staaken R.VII 14/15 photographed before the fatal take-off crash at Halberstadt. 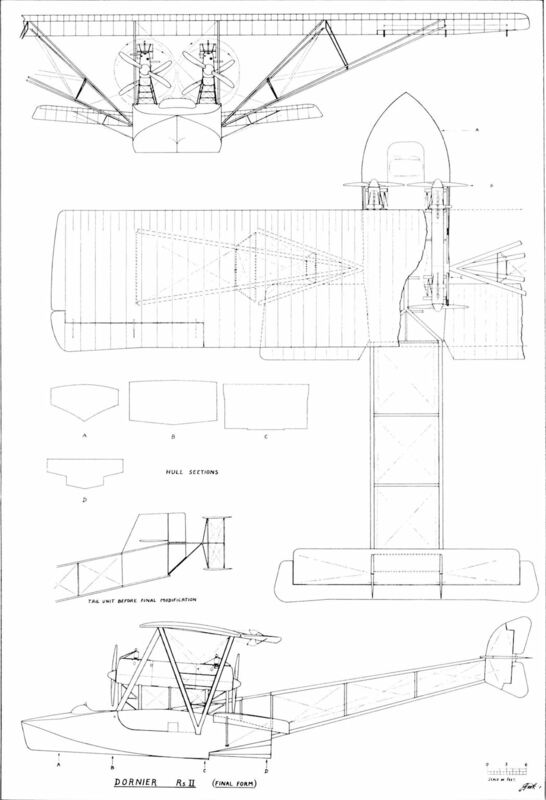 Staaken R.VII 14/15, with four-bladed tractor propeller. 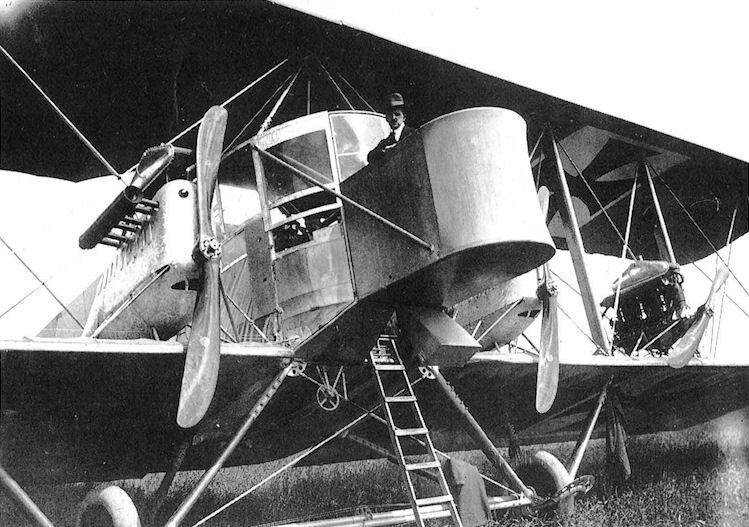 Staaken R.V 13/15, fitted with two-bladed propeller at the nose. Staaken R.V 13/15. 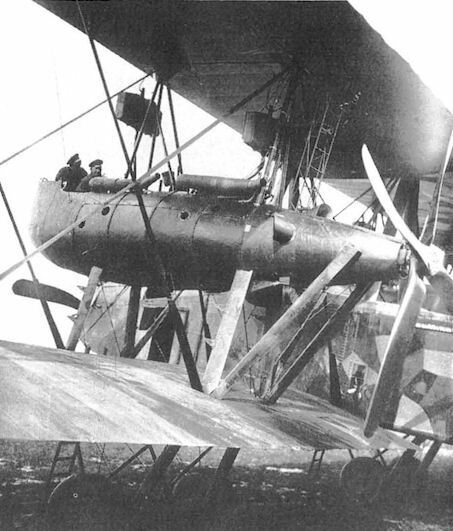 The engines are being tested in preparation for a night mission from Scheldewindeke in 1918. Gun positions of the Staaken R.V. 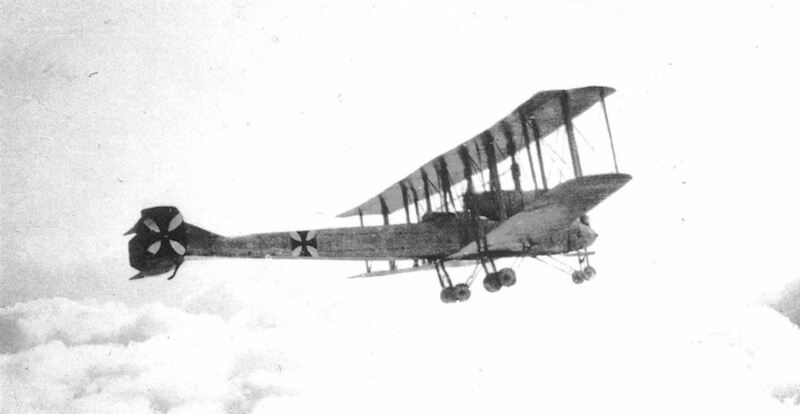 The Staaken R.XVI (Av) 50/17 in flight. 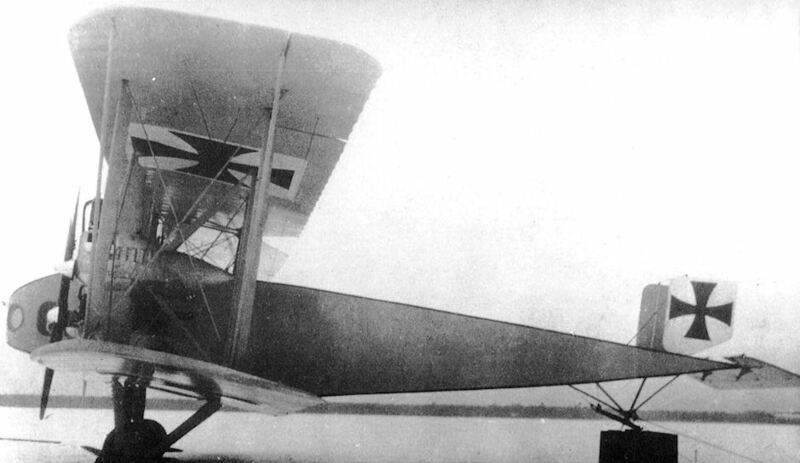 Staaken R.XVI(Av) 50/17, one of the R-planes completed after 31 January 1919, with company markings. 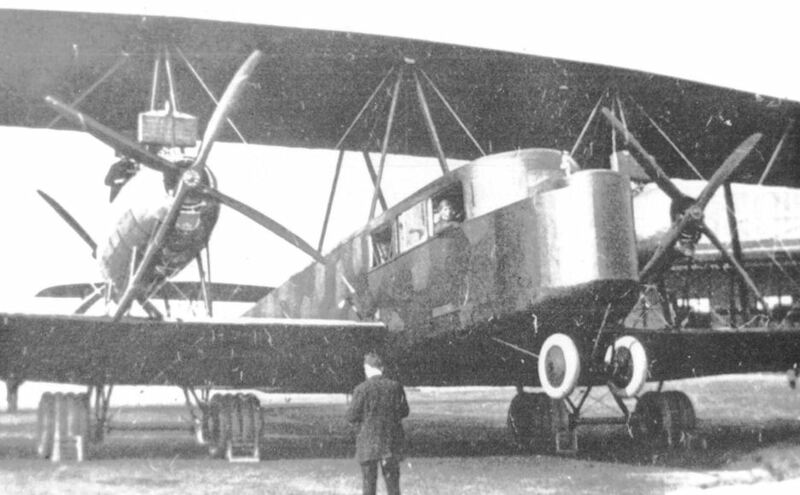 The Staaken E.4/20 all-metal airliner of 1920. 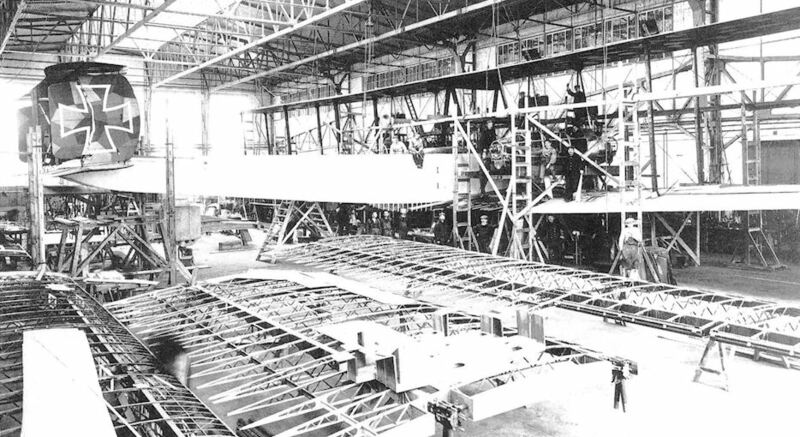 The Staaken E.4/20 under construction.